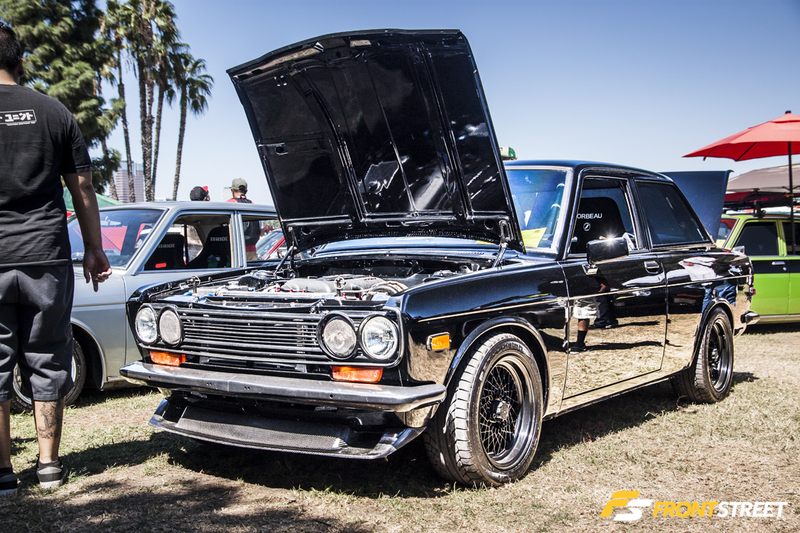 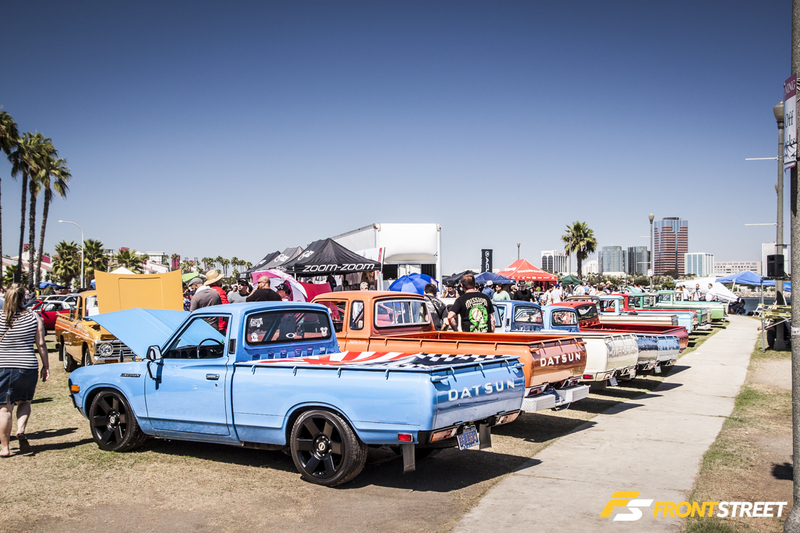 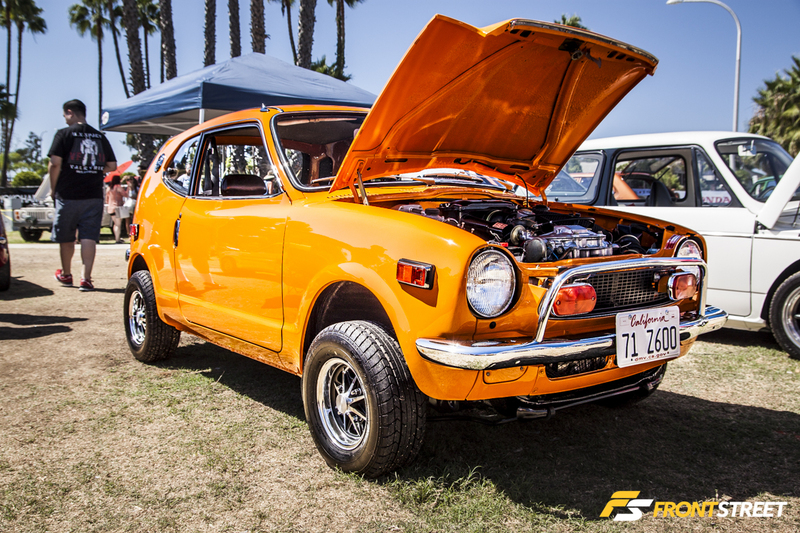 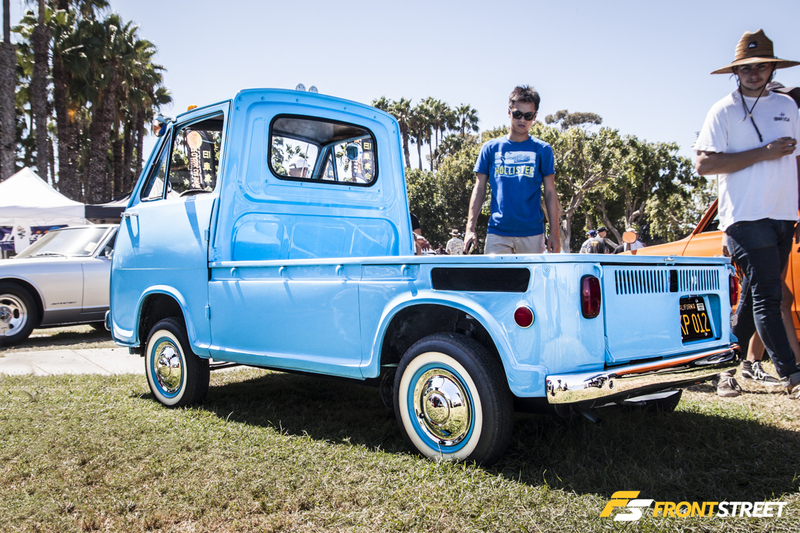 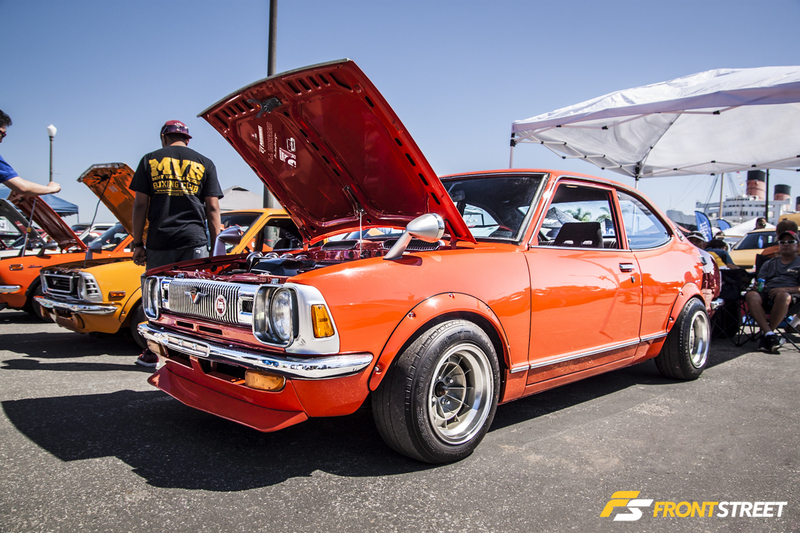 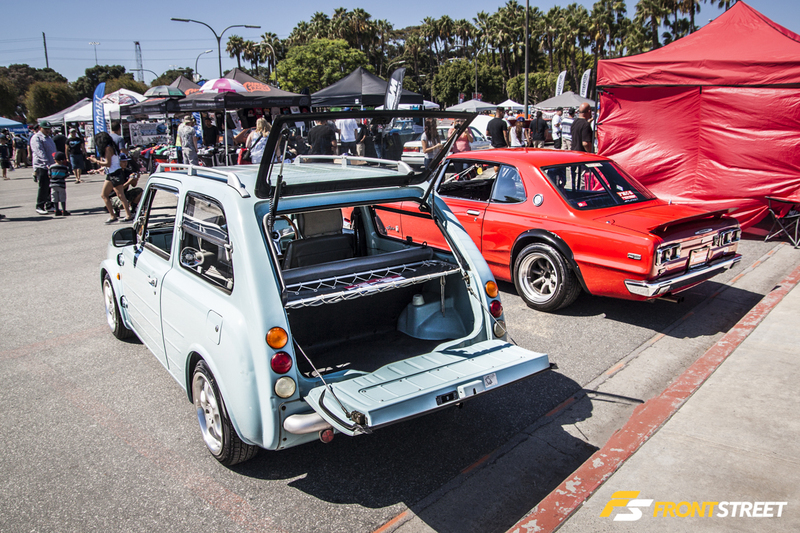 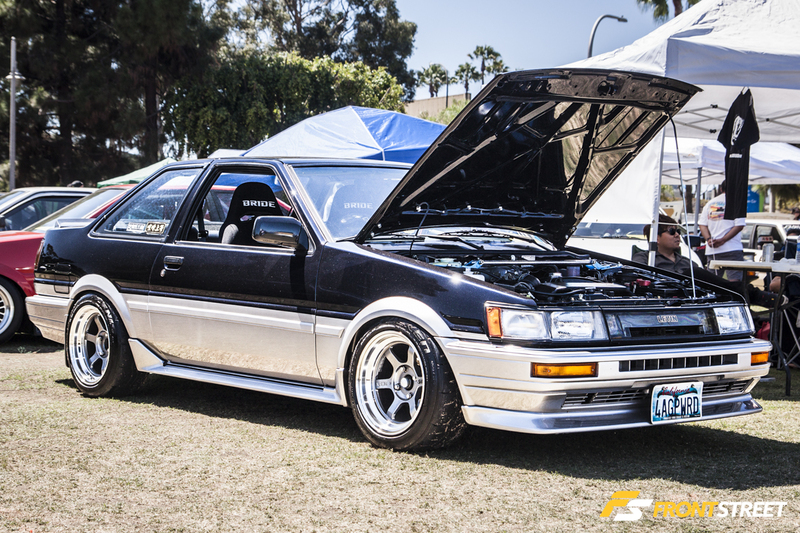 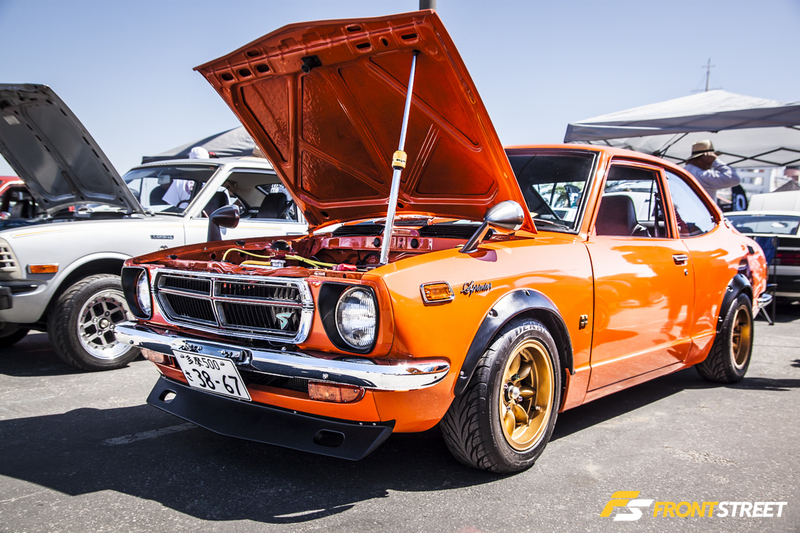 Once a year under the Southern California sunshine, car enthusiasts gather to witness some of the finest vintage Japanese automobiles in the country. 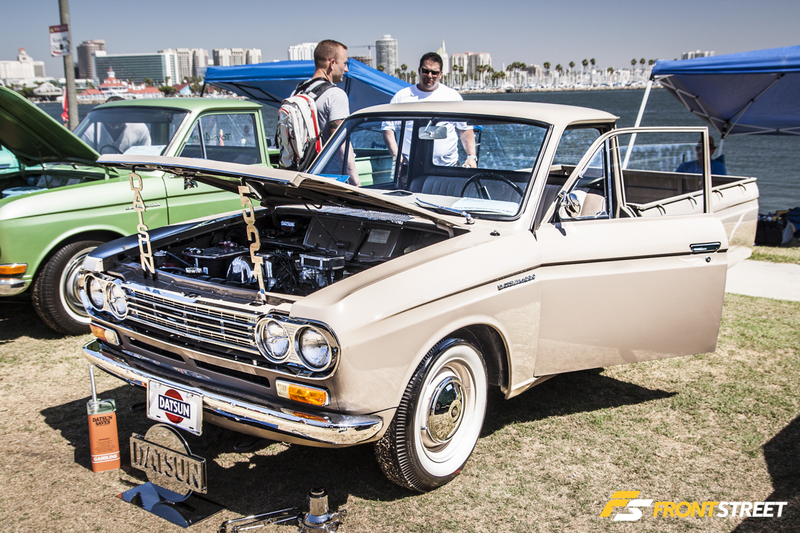 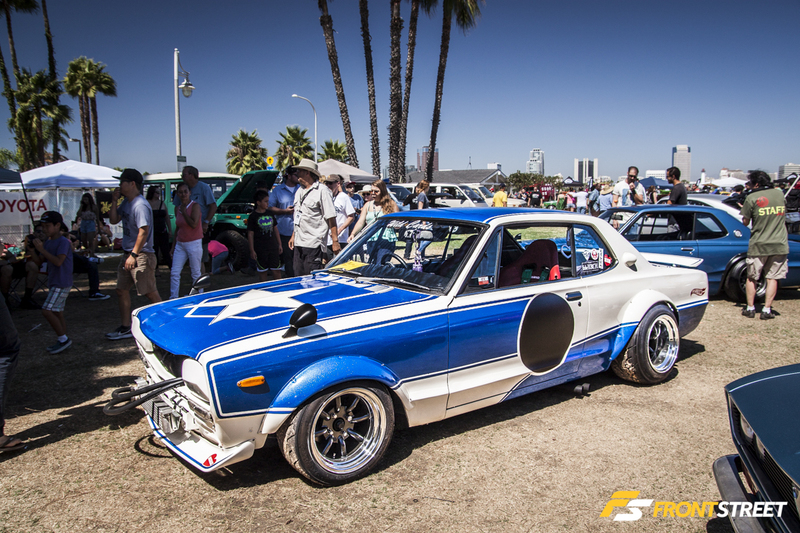 The Queen Mary in Long Beach, California played host to the 11th annual Japanese Classic Car Show. 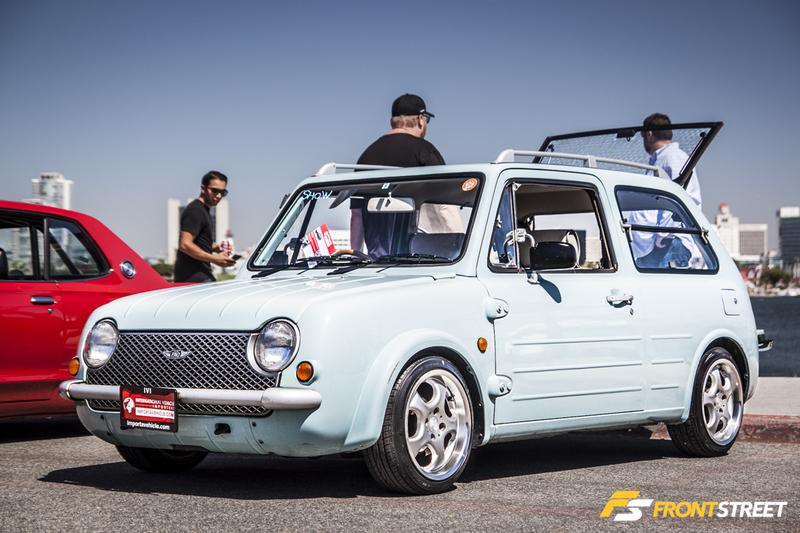 The Aqua Grey paint on this Nissan PAO was one of just 4 original color options for this two-door hatchback from International Vehicle Importers. 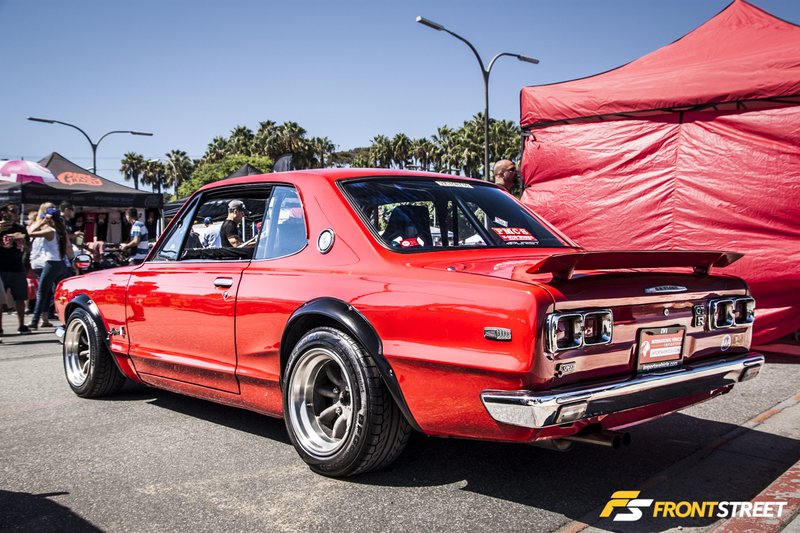 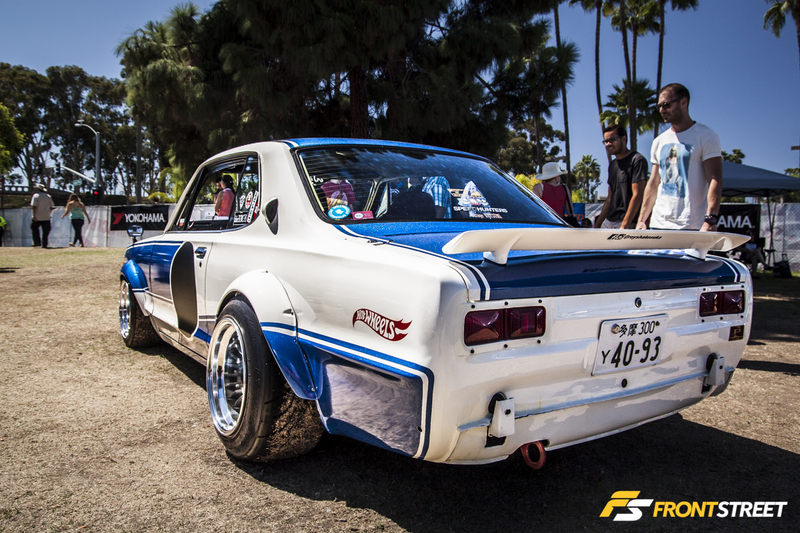 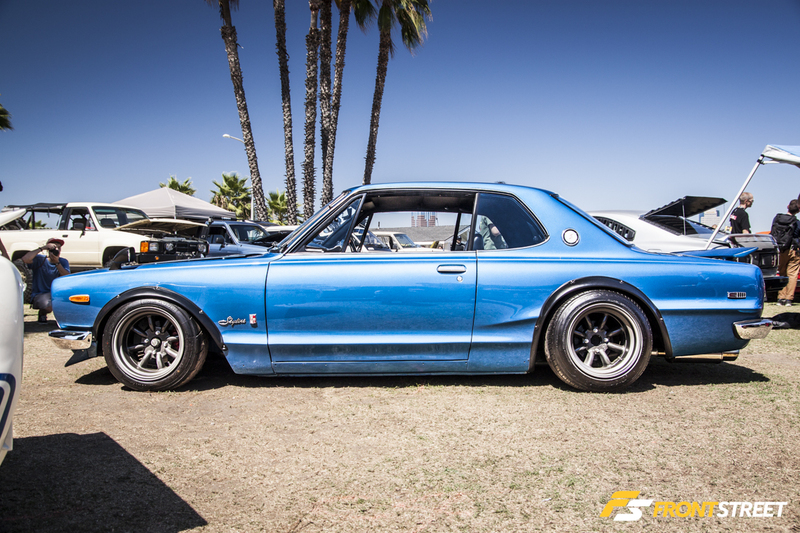 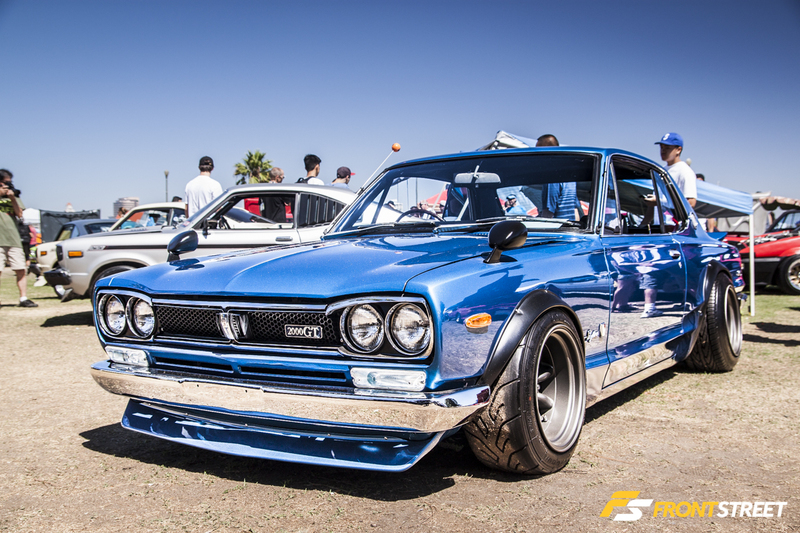 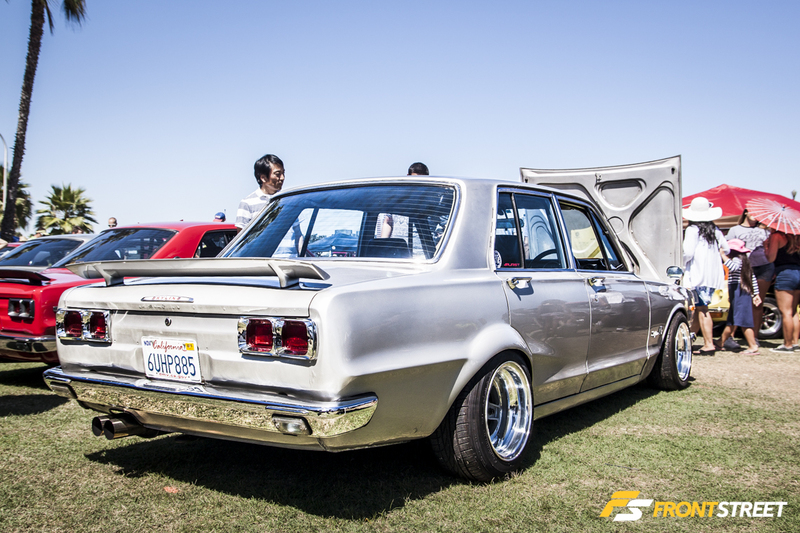 Hakosuka Skylines are always a favorite chassis at this event. 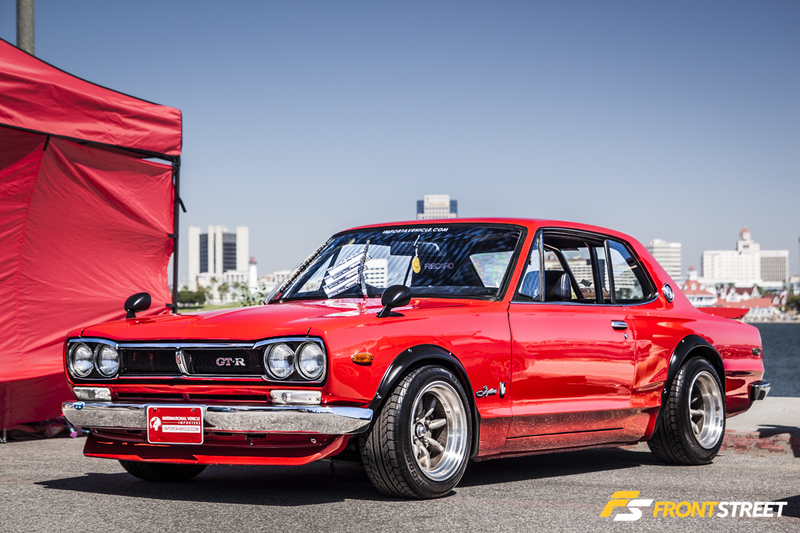 This red GTR model housed a roll bar inside, and a wide set of RS Watanabe wheels outside. 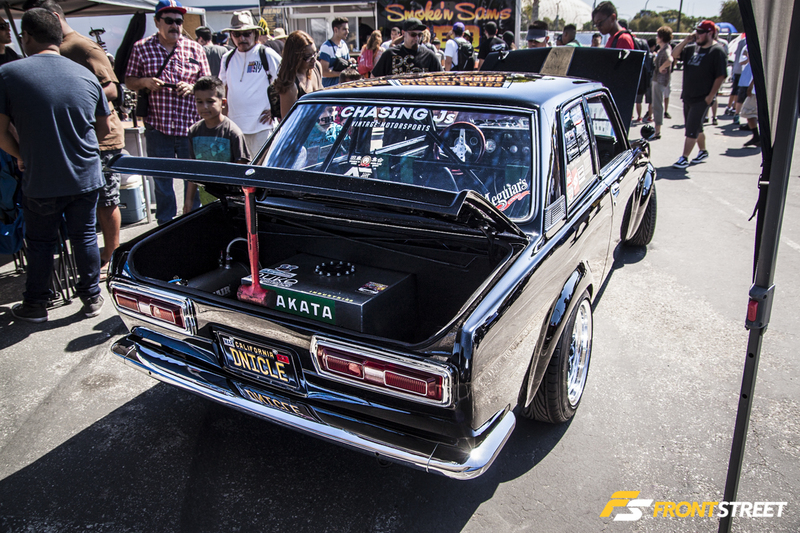 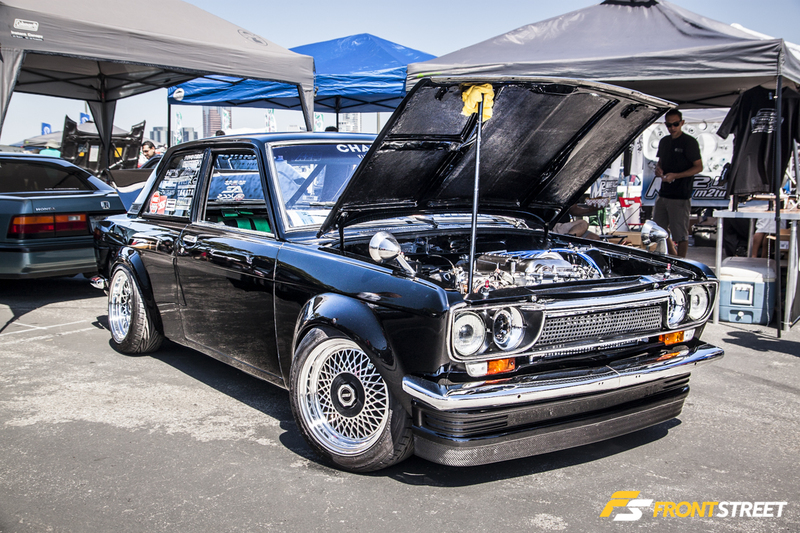 Datsun 510s are another popular chassis, although not many are modified to the extent of this pristine black example. 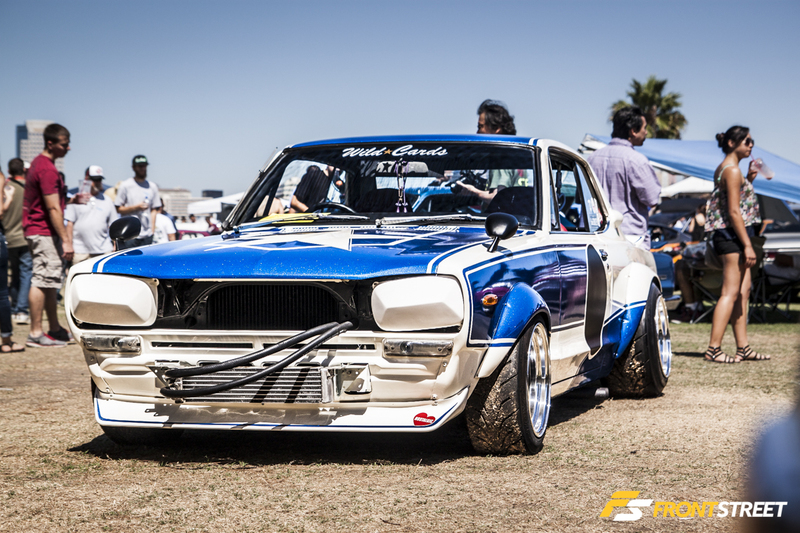 With a Nissan SR20 engine swap, a roll bar with Takata harnesses, and numerous gauges, this “Bluebird” drew a crowd. 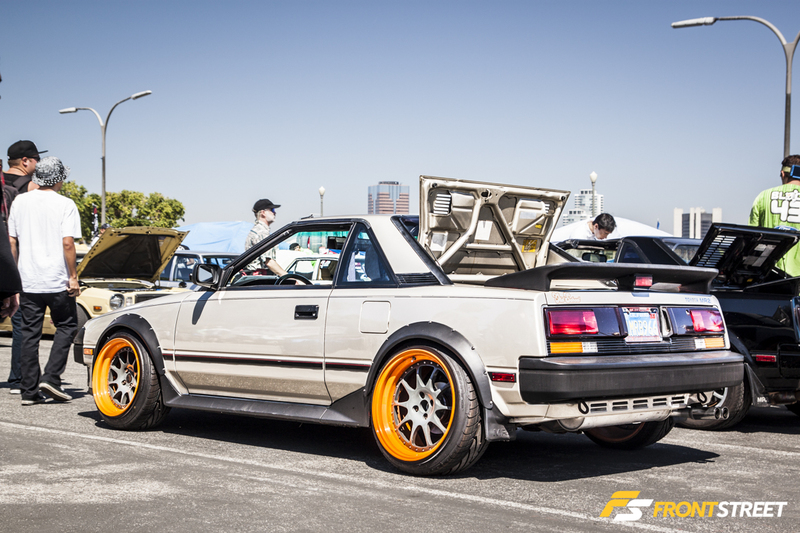 Standing out from the Champagne colored paint and the trim black bumpers, the wide 3-piece wheels with orange lips brought a fresh look to the nostalgic AW11 chassis. 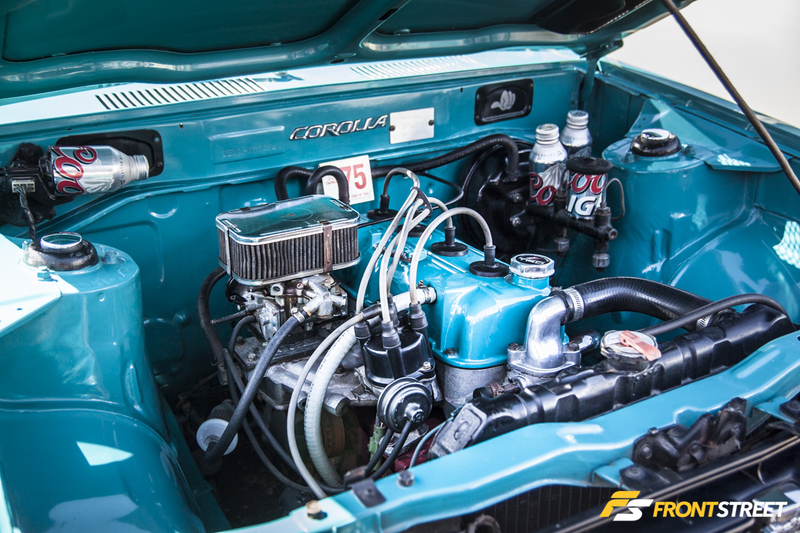 Keeping the original motor intact, this restored TE27 Toyota Corolla hid some of the under hood components by cleverly using Coors Light bottles. 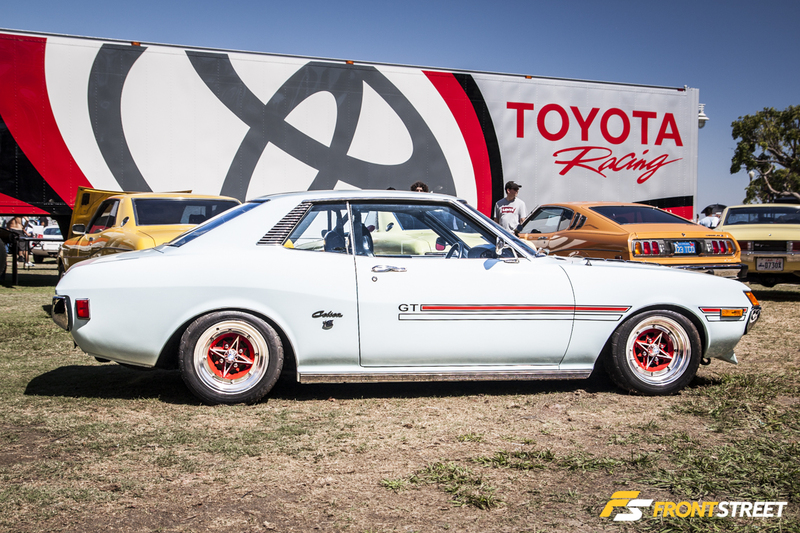 TE28 wagons were not the quickest family haulers from the factory, but swapping a 3RZ-GTE engine will change that. 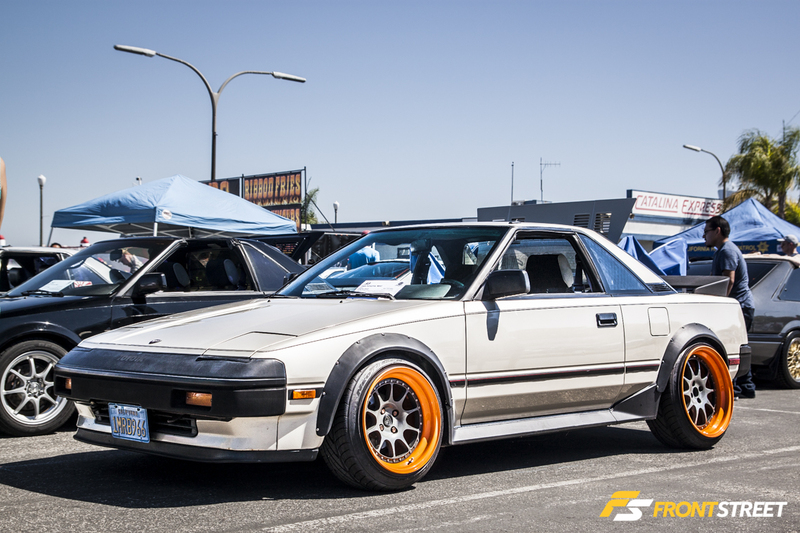 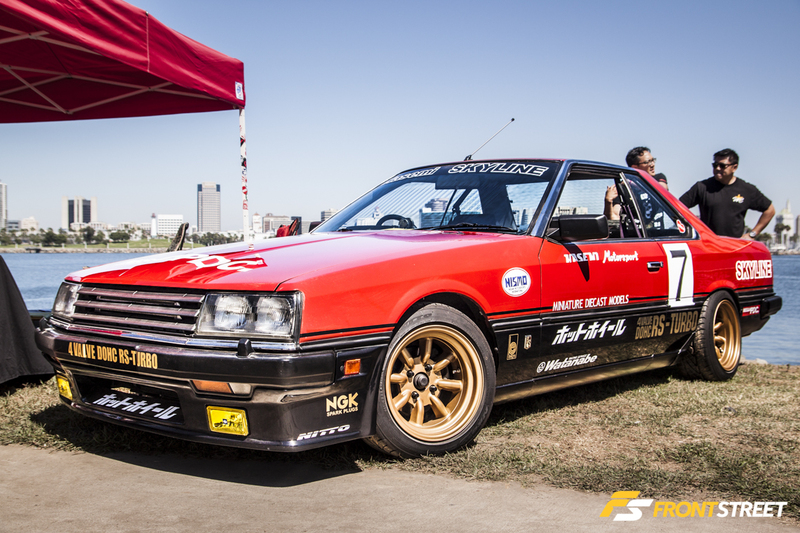 This RHD TE27 Trueno Sprinter had wide bronze Panasport-style wheels and vivid orange paint. 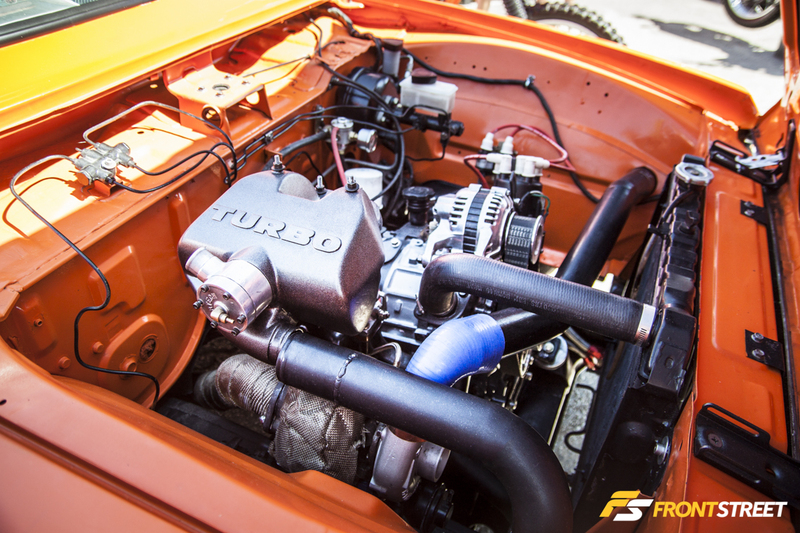 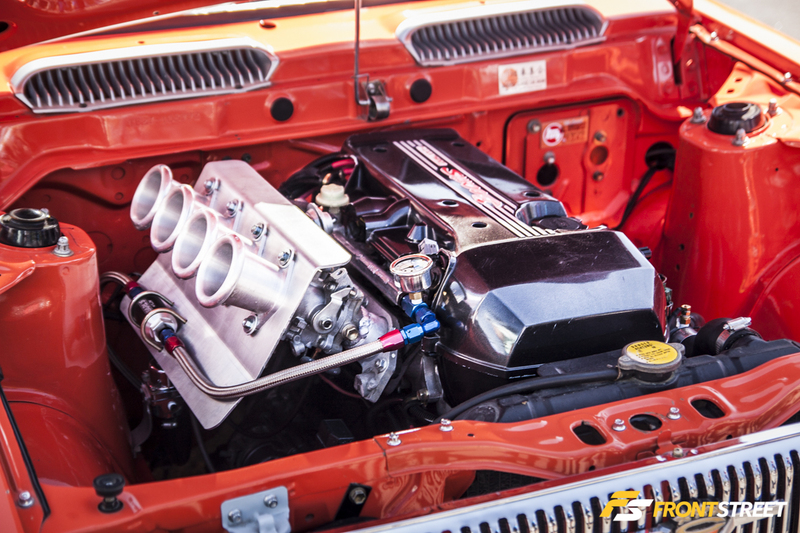 Another orange TE27 featured a 3SGE engine swap with individual throttle bodies. 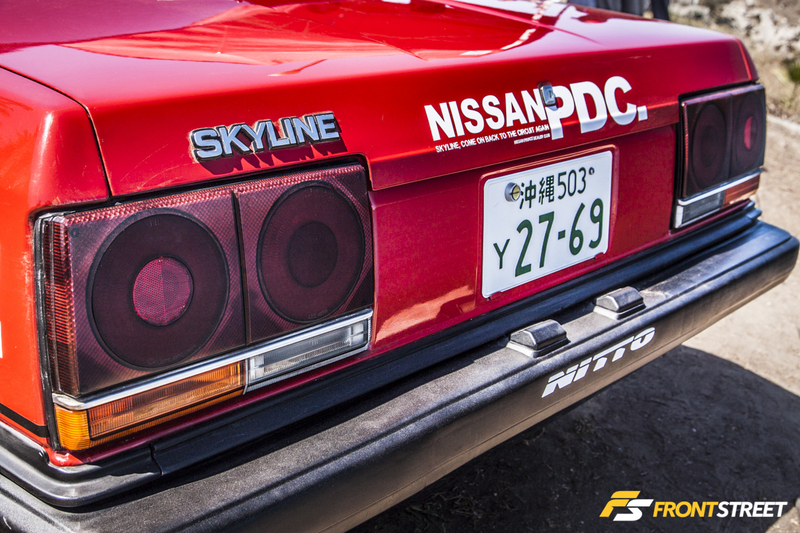 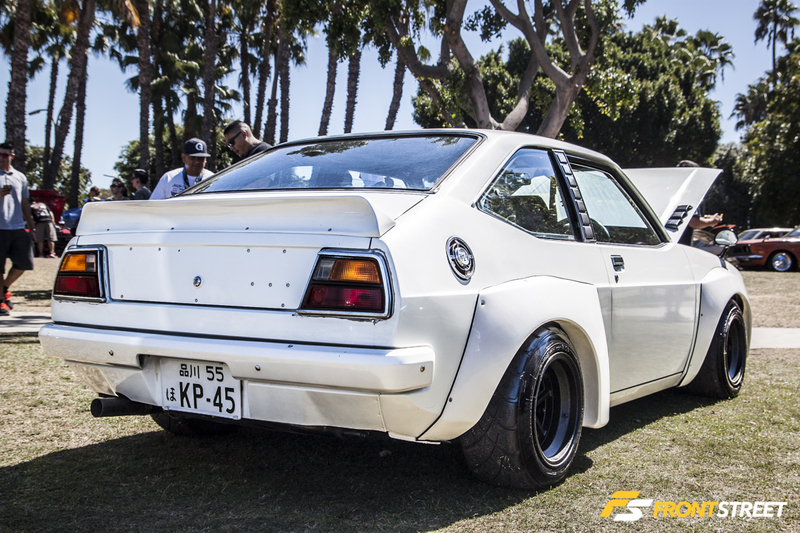 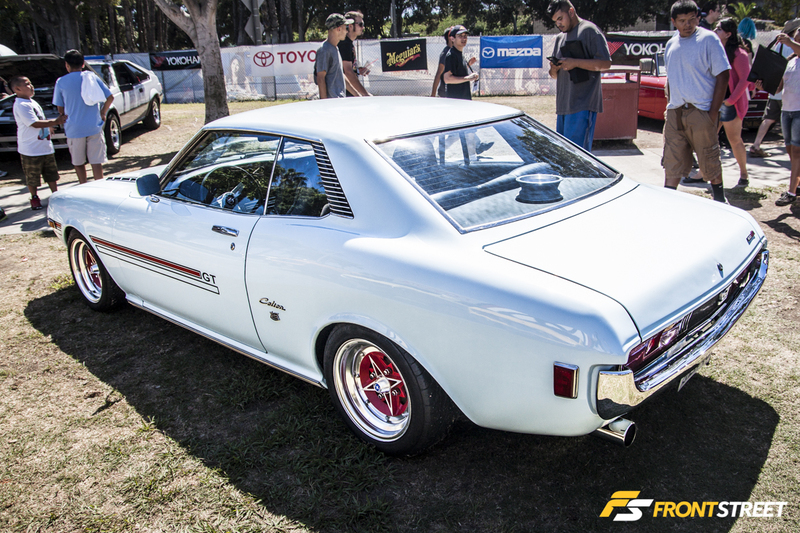 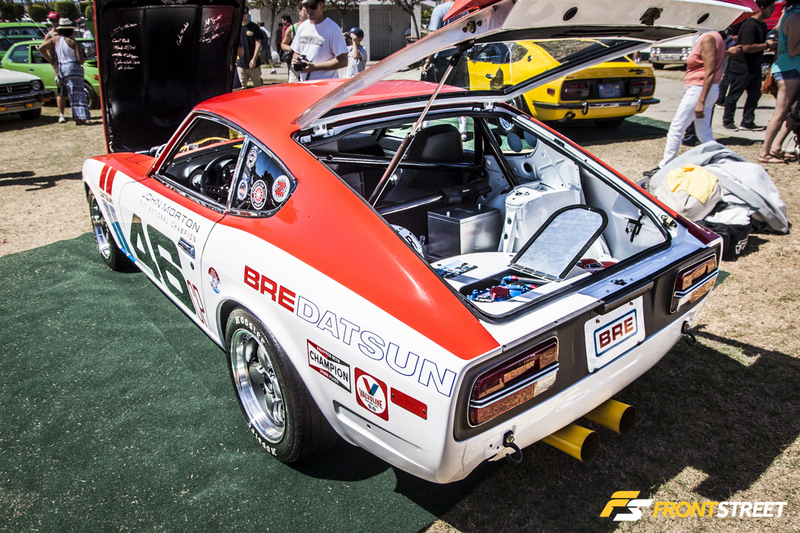 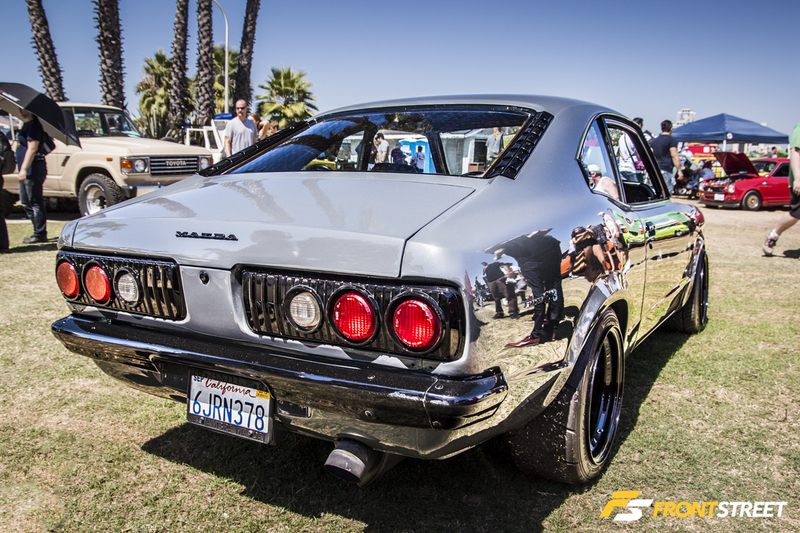 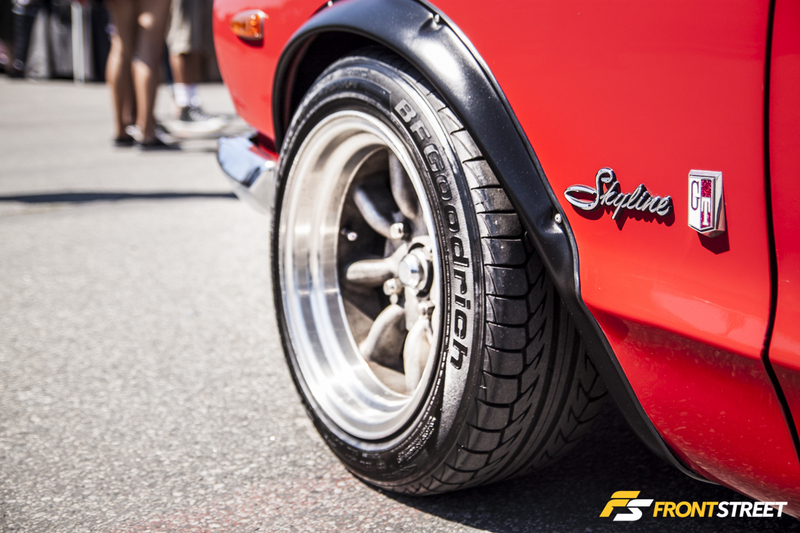 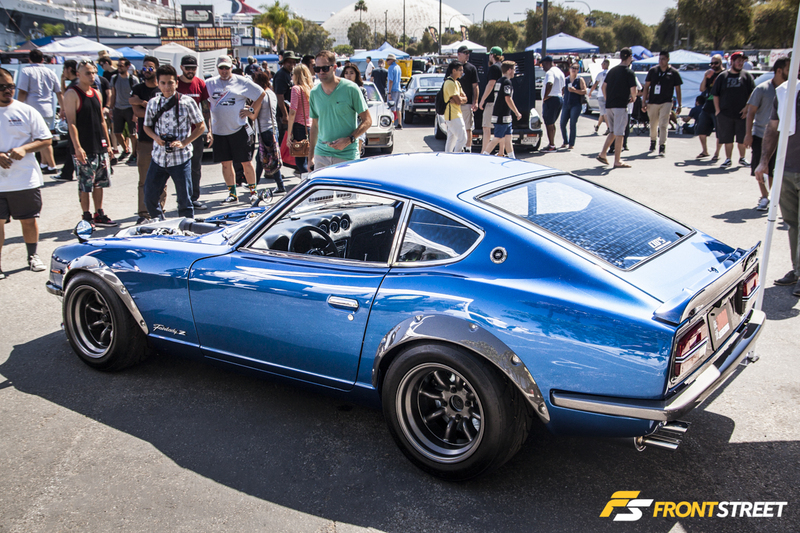 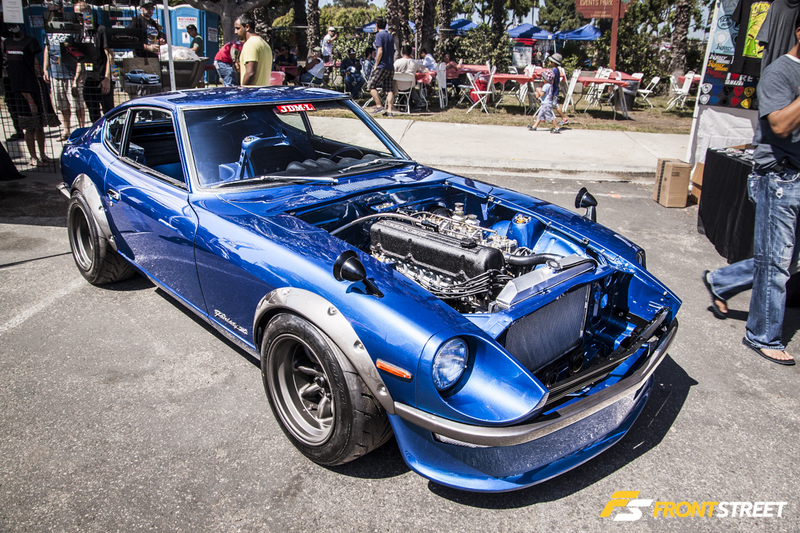 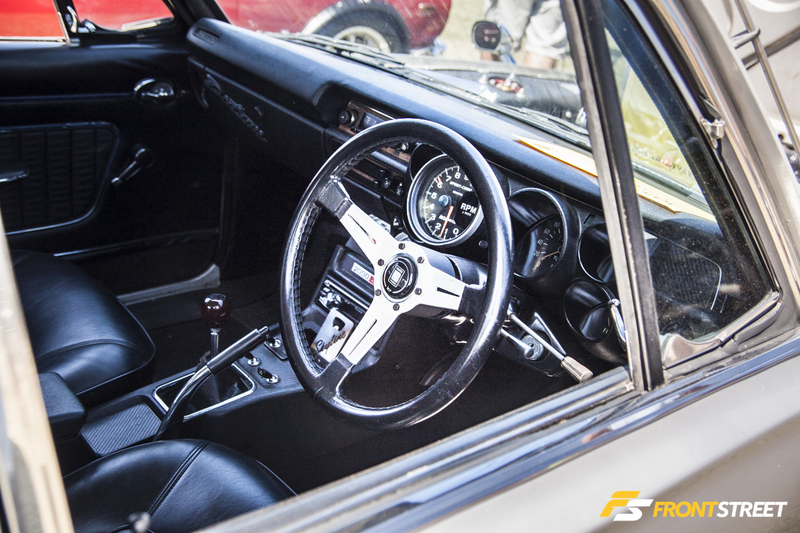 Originally designed with RS Watanabe wheels in mind, the Datsun 240Z had a large showing at this year’s event. 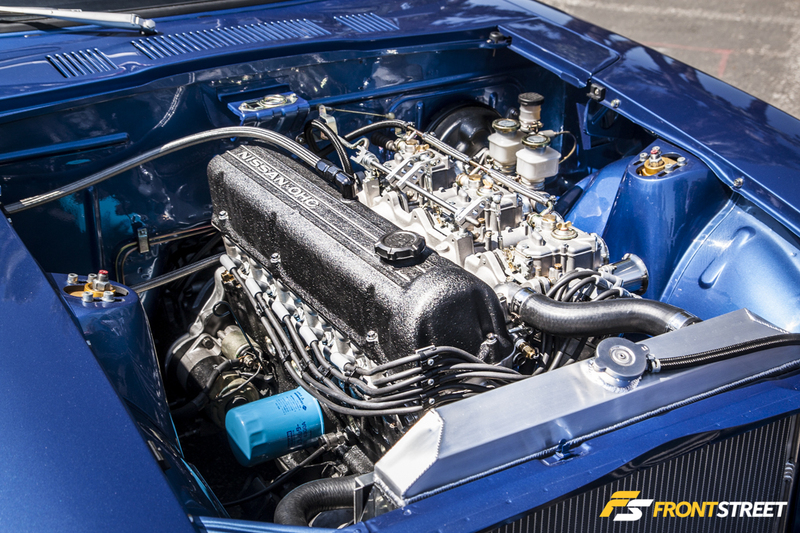 This particular example was meticulously refinished, all the way down to the stripped interior repainted in the same shade of blue found on the exterior. 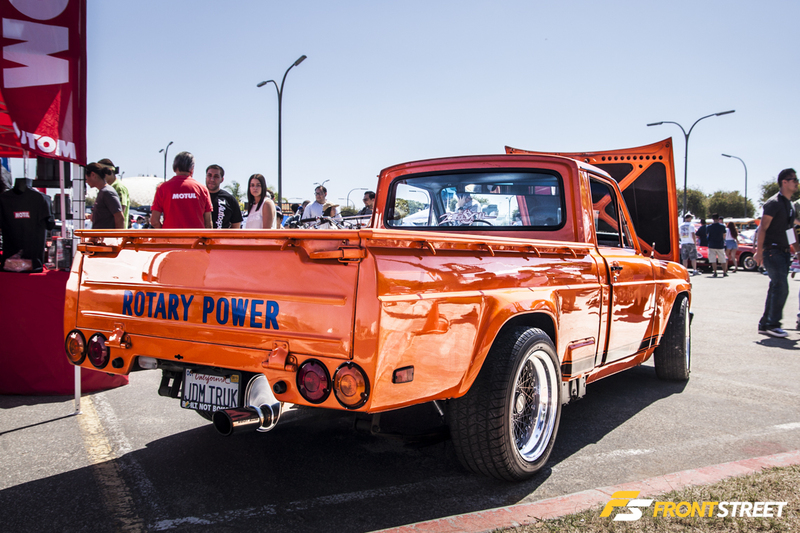 The Mazda REPU or Rotary Engine Pickup was the first truck to be powered by a Wankel Rotary engine. 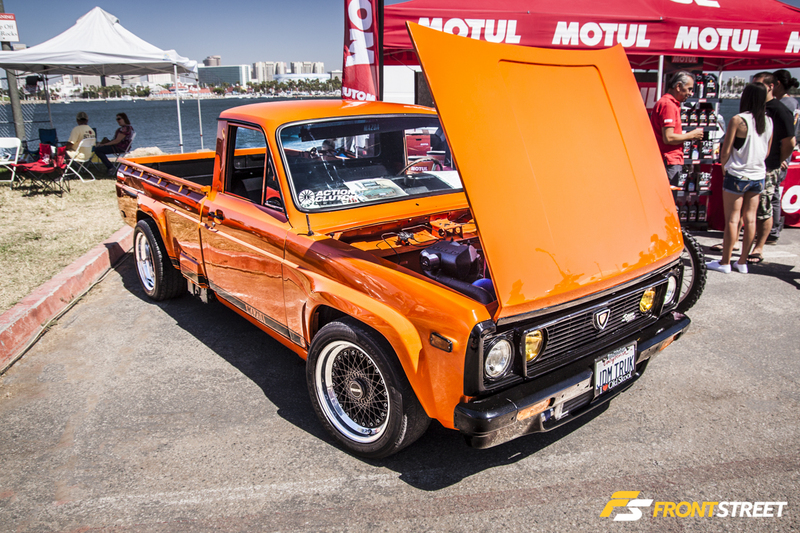 The owner of this truck looking for more power is almost done converting the engine to a turbo 13B. 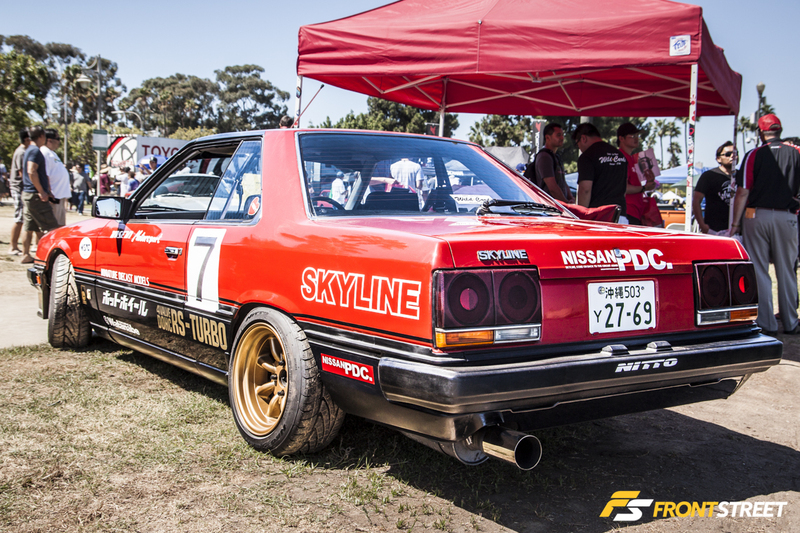 Mimicking the Super Silhouette Racer of yesteryear, this R30 Skyline carried the familiar TOMICA Hasemi Skyline livery throughout its virgin body. 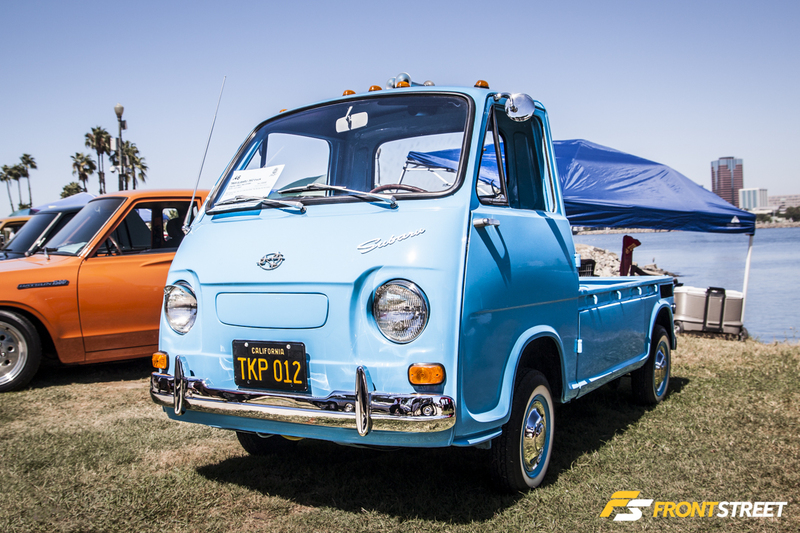 A nicely restored Subaru Sambar pickup parked amidst a line of classic pickups. 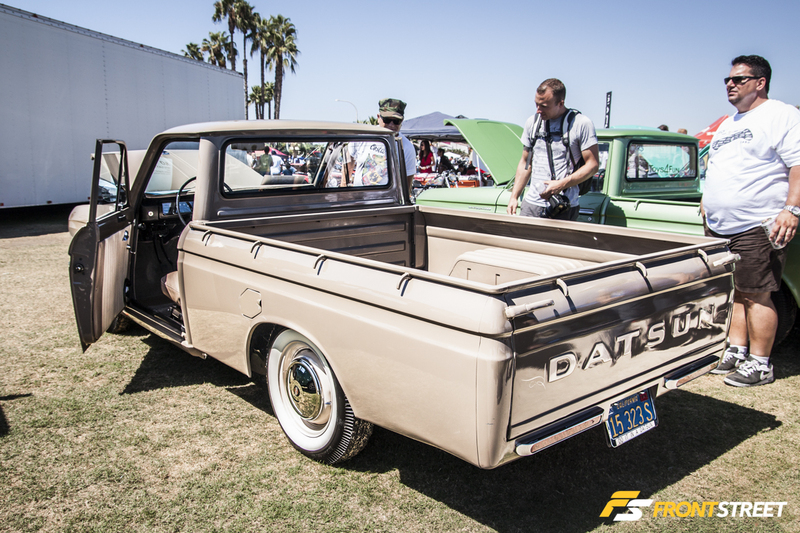 The Datsun pickup lineup was impressive including this khaki-colored 521 with perfect condition refinished chrome hubcaps. 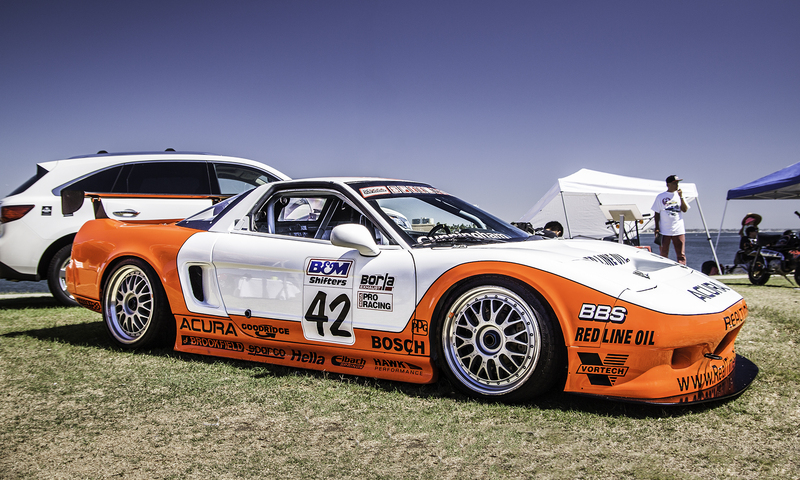 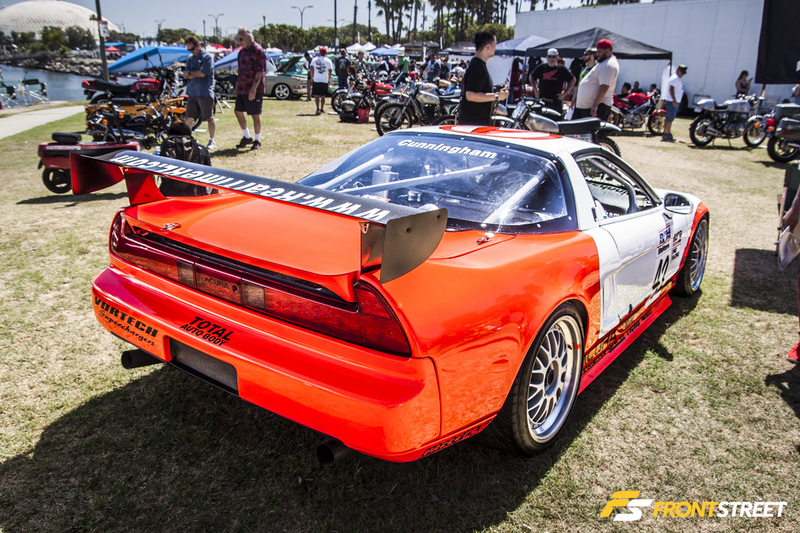 The RealTimeRacing NSX sporting their inconic two-tone orange and white paint showcased the motorsports ability of the classics in attendance. 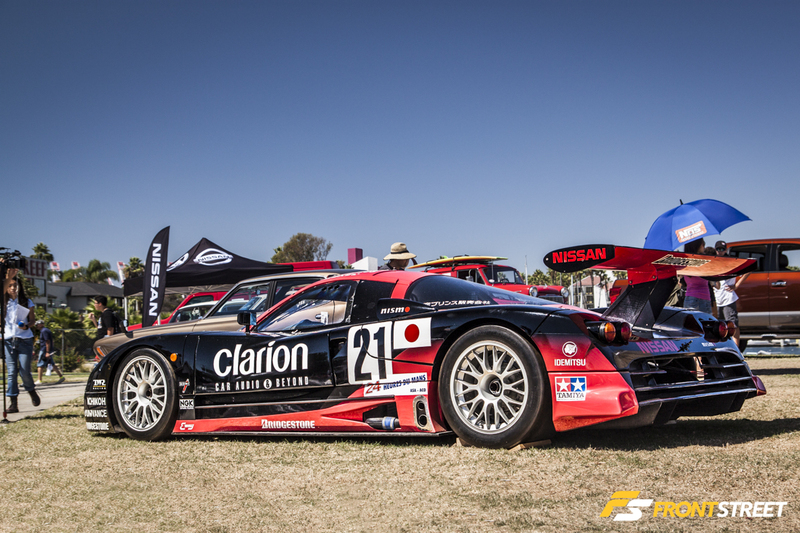 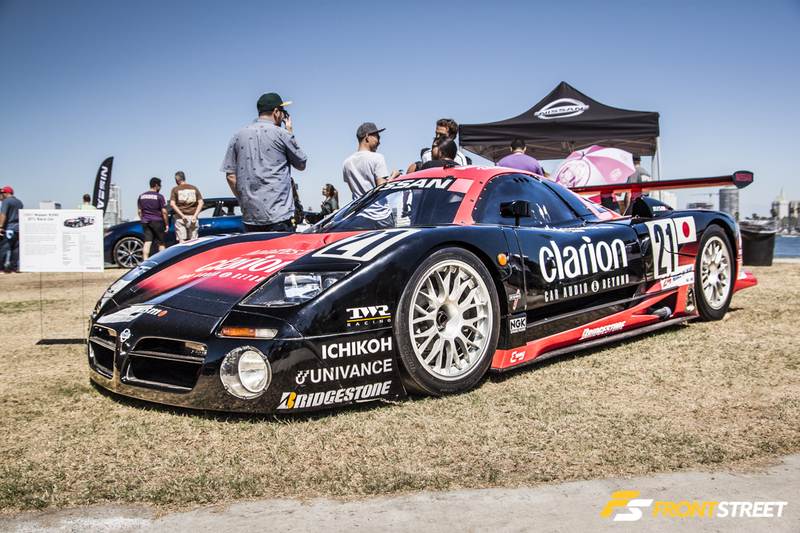 The most modern of the attending cars, the #21 Clarion Nissan R390 GT1 looked ready for action, having not competed in a race since the 1997 24 Hours of LeMans. 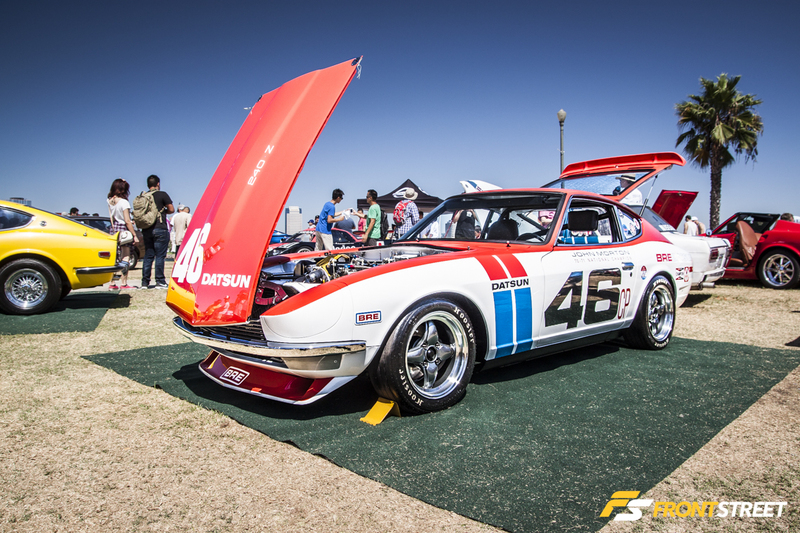 Tying into the Nissan motorsports heritage was this 240Z covered in the livery of John Morton’s SCCA National Championship winning Z-car. 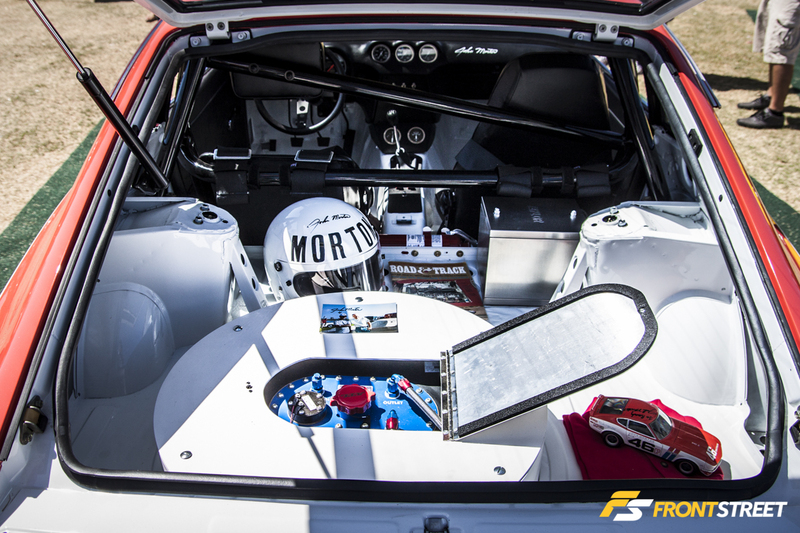 The interior was full of autographed John Morton memorabilia including a matching die-cast model of the championship-winning car. 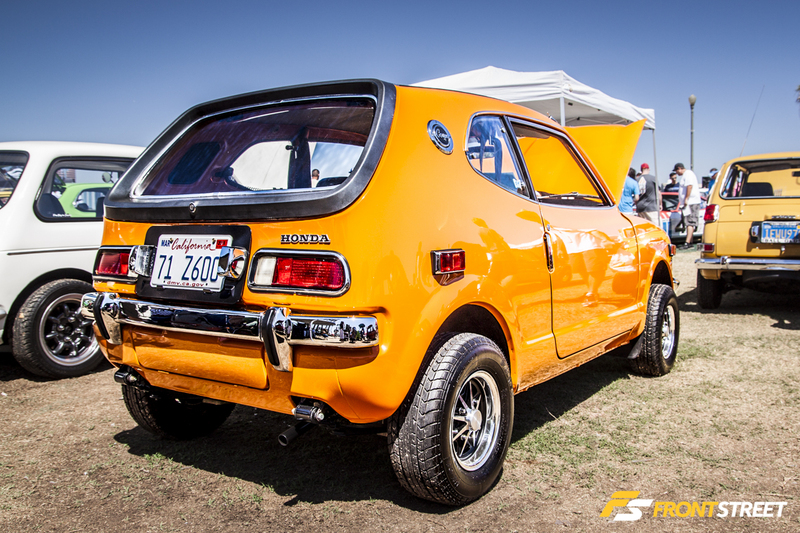 Orange was the period correct restoration color of choice for many of these automobiles, illustrated by this little Honda Z600. 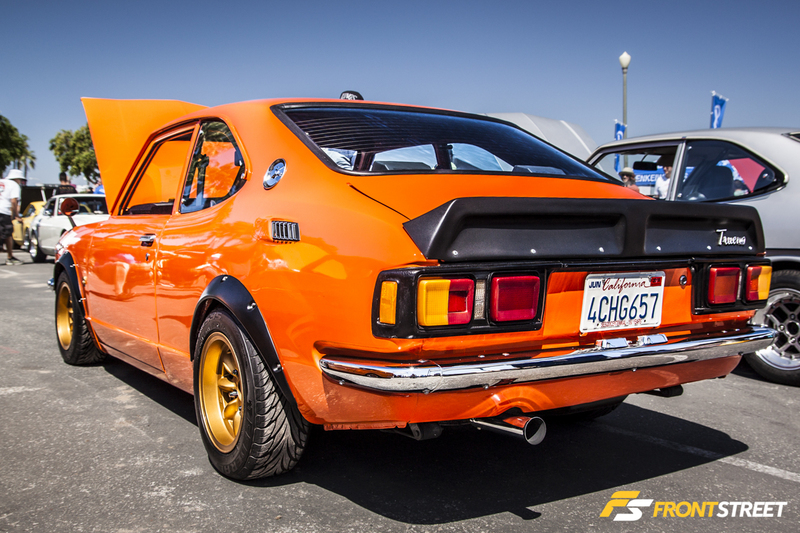 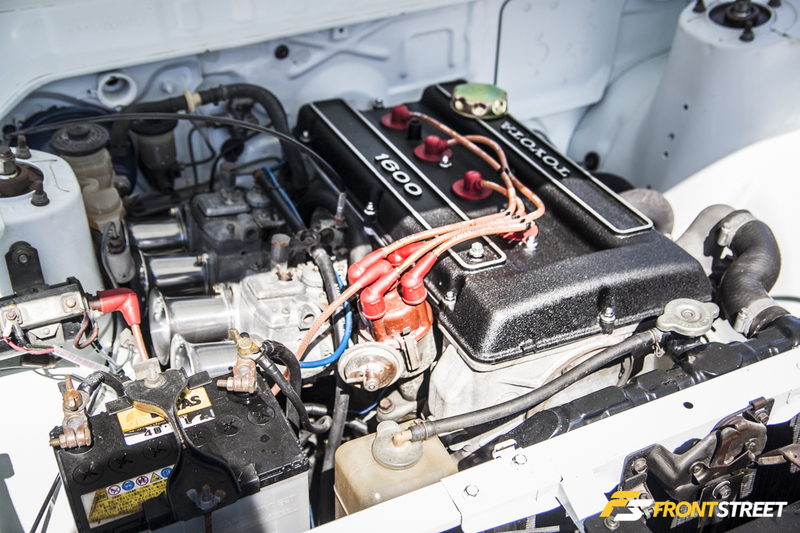 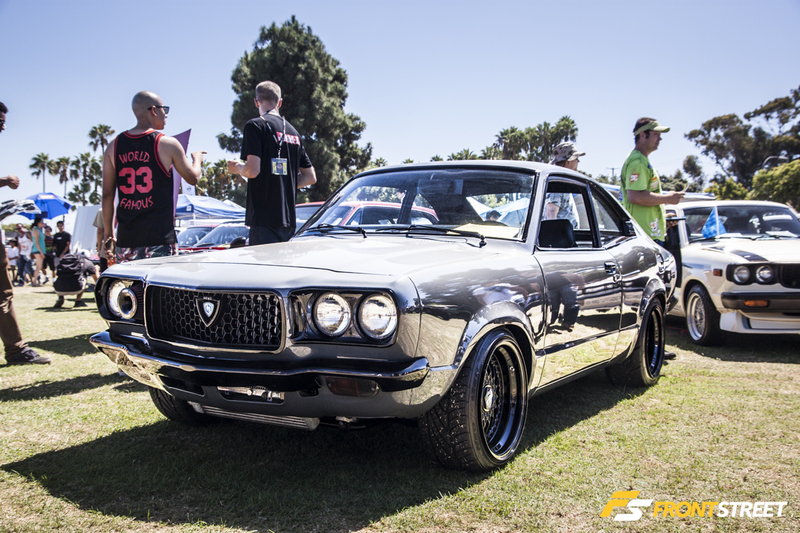 Knowledge of this turbocharged Mazda RX3 build grew overnight due to its recent feature on Jay Leno’s Garage. 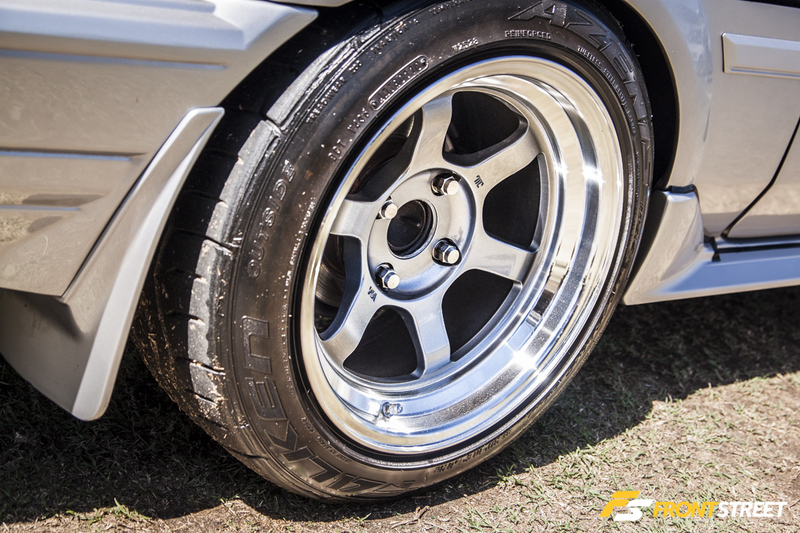 The black bumpers and BBS RS wheels were a perfect contrast to the Grigio Telesto paint used on the body of the car. 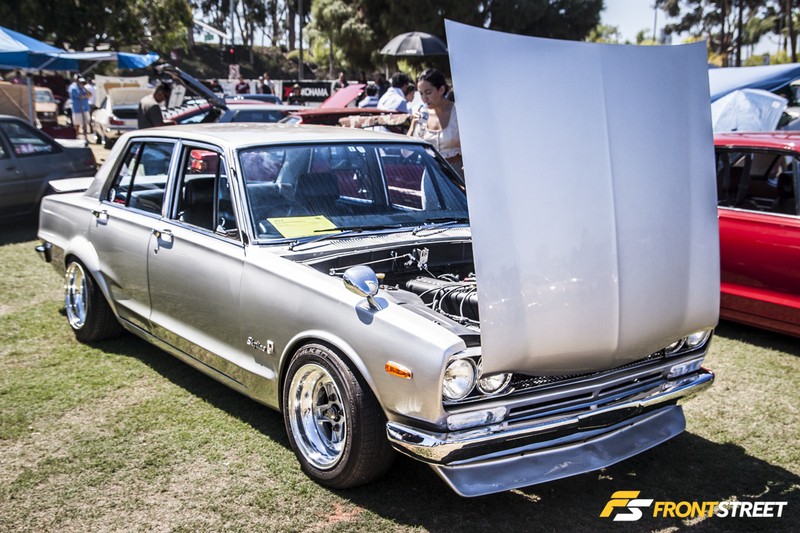 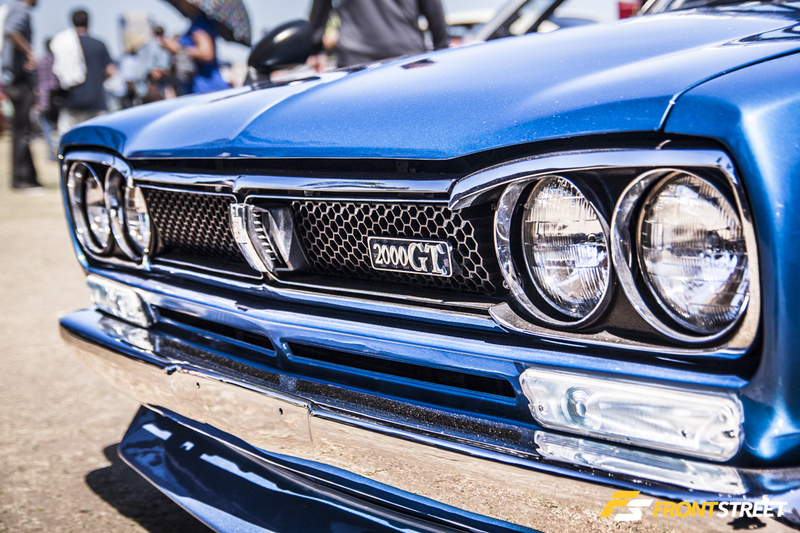 With the hood open showing off the fresh L-series Nissan engine, this subtle Hakosuka Skyline sedan didn’t need modifications to stand out. 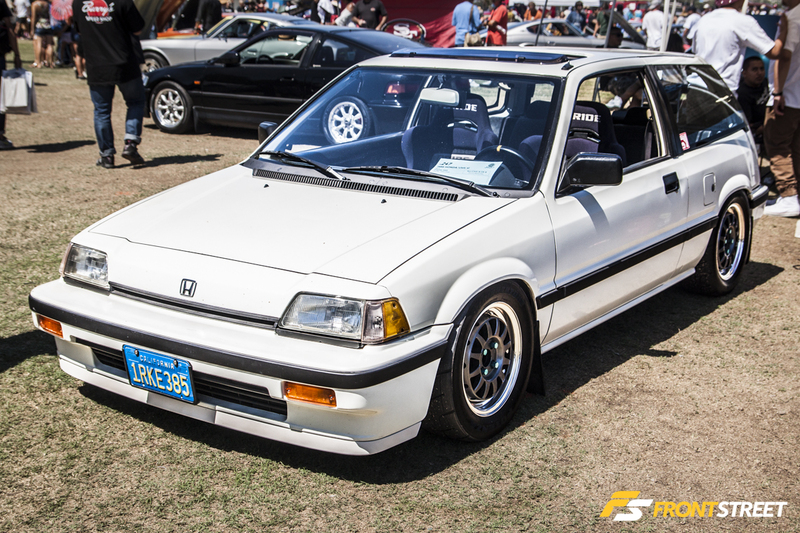 This white EA-T (or Wonder) Civic hatchback had a center-exit exhaust in the rear, and rare Wedssport Kurage wheels mounted to the hubs. 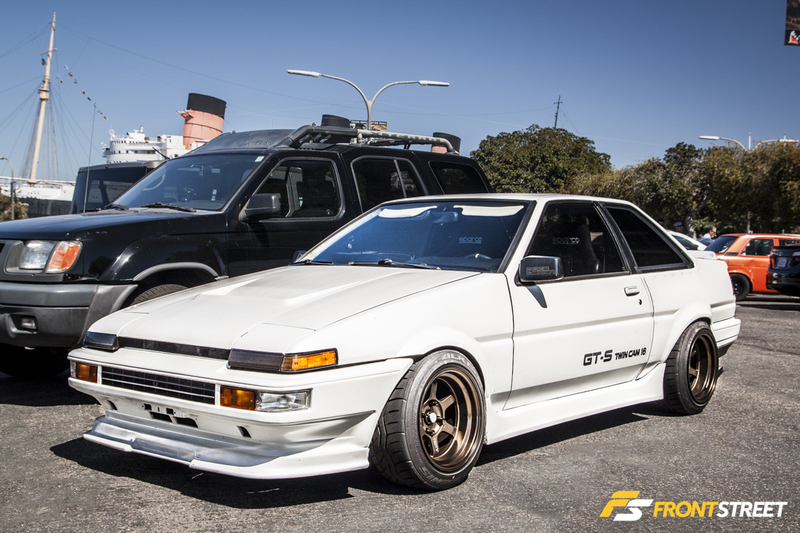 80’s styling was evident with the two-tone paint on this Levin-front end converted AE86 Corolla. 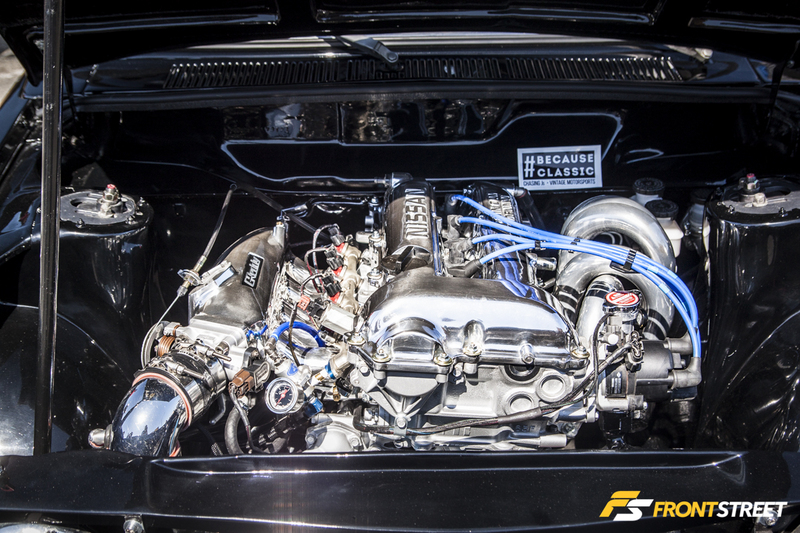 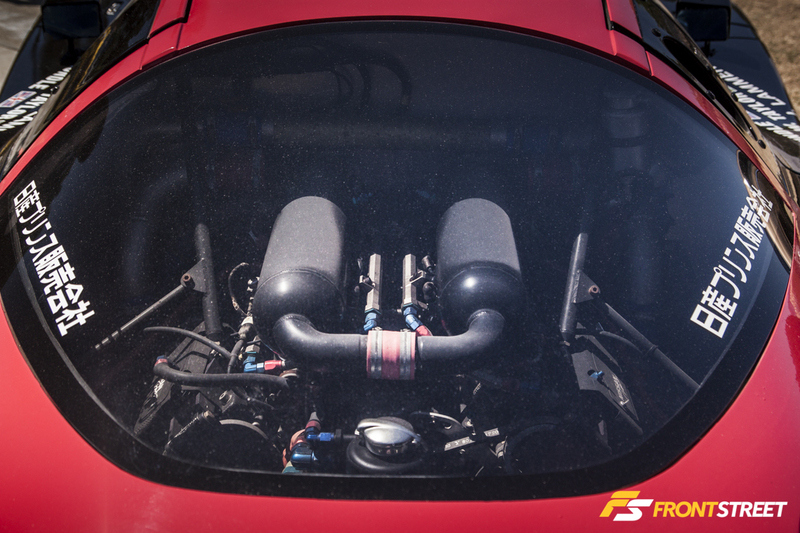 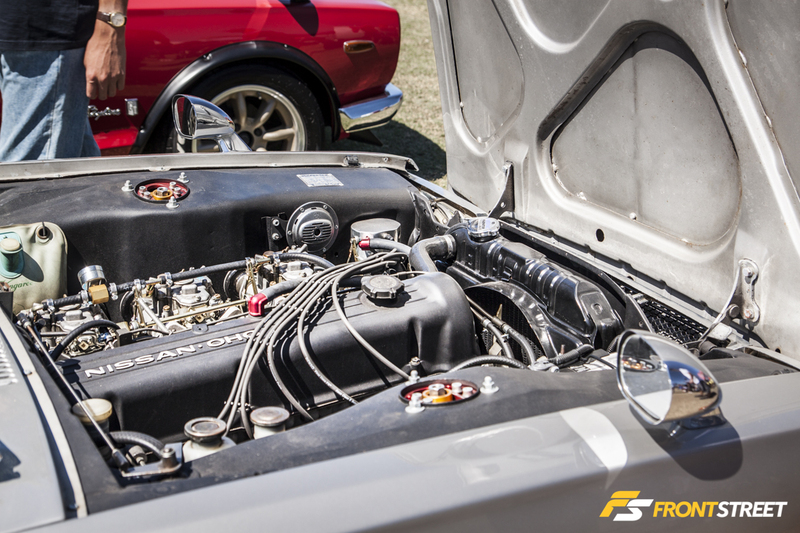 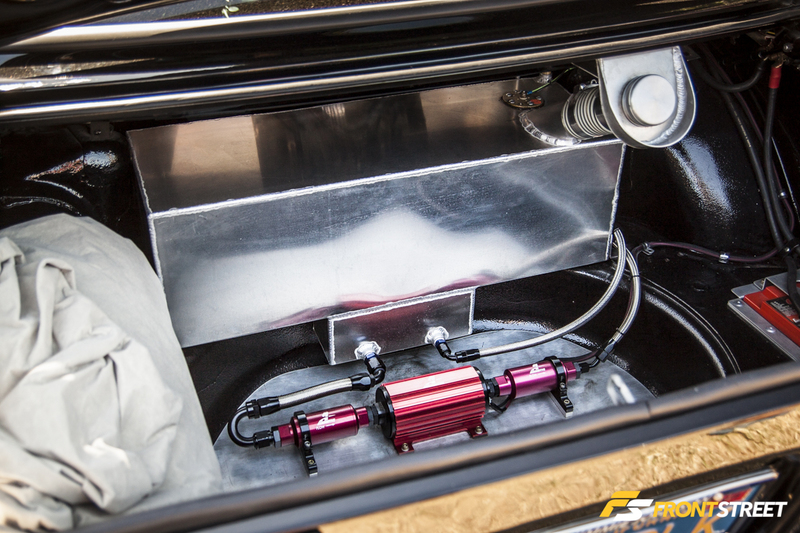 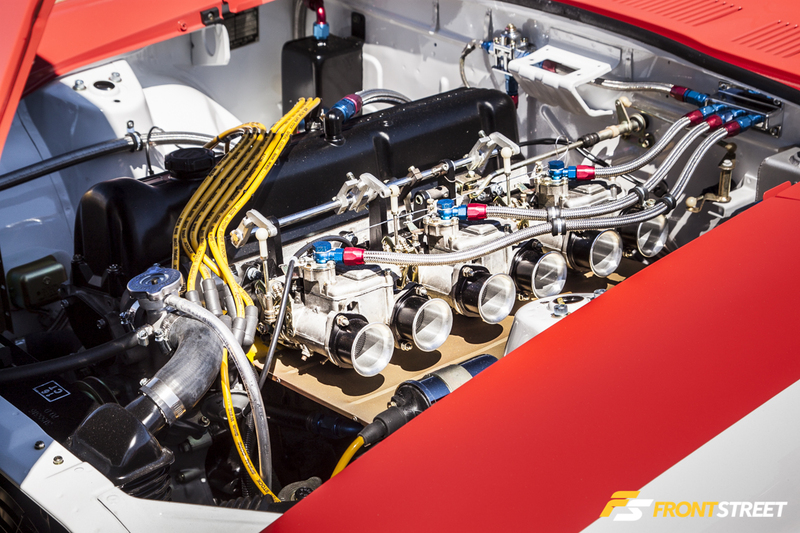 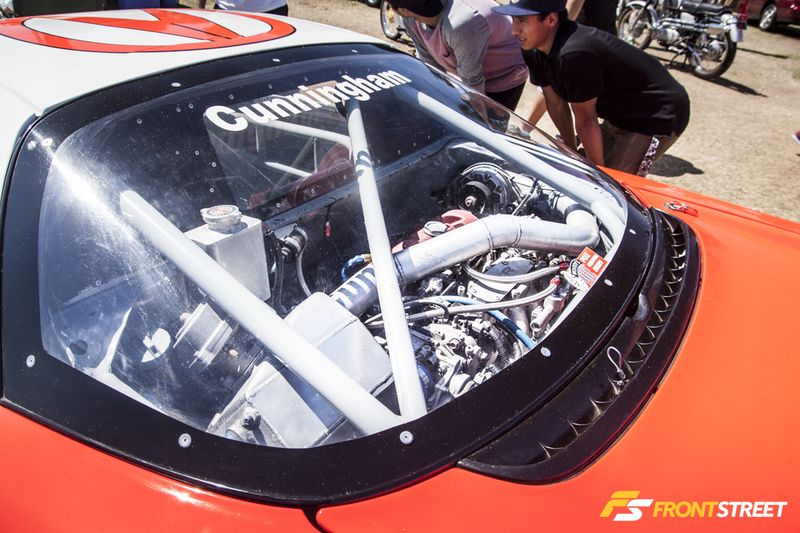 A coveted 4AG power plant resides in the clean engine bay, while Volk Racing TE37V wheels completed the exterior. 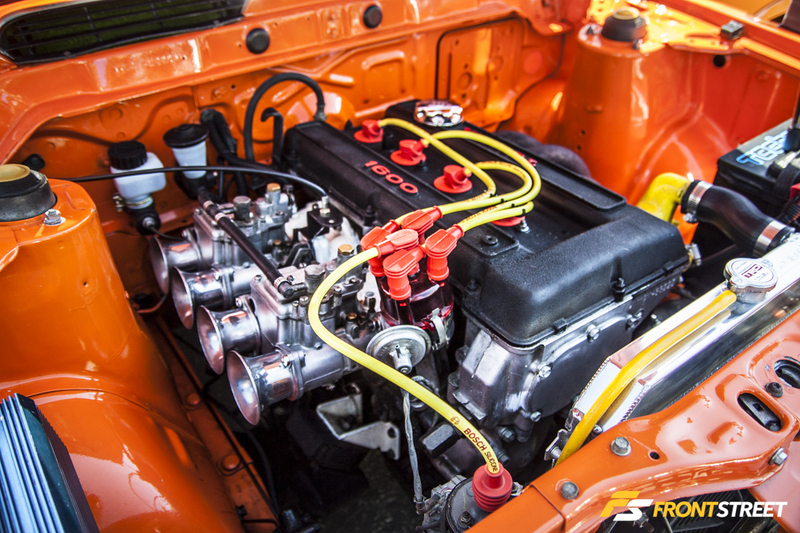 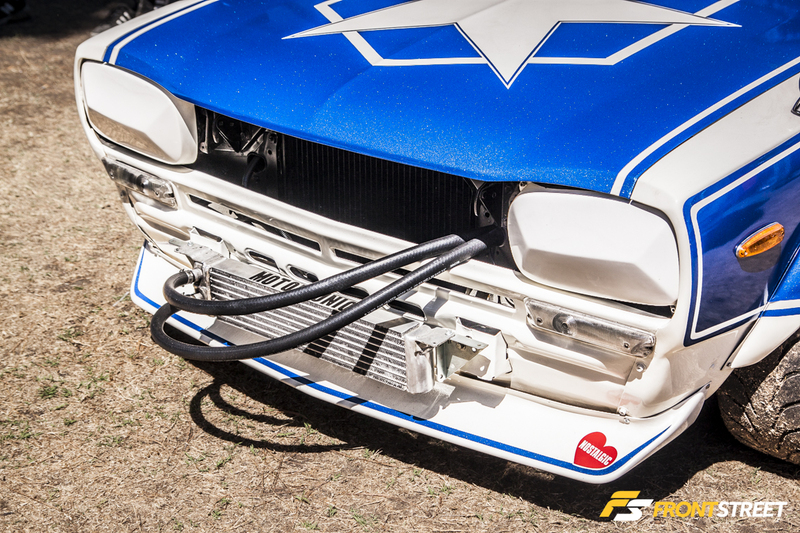 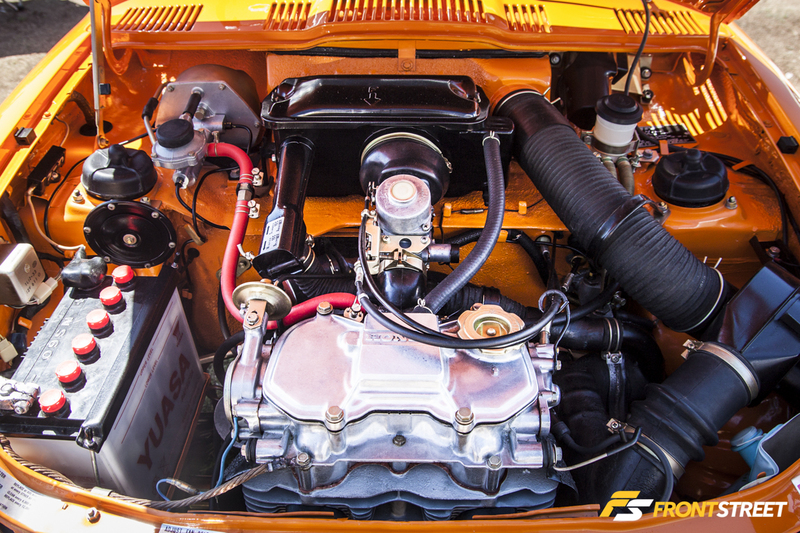 Emulating classic Japanese Bosozoku style, this enthusiast externally mounted an oil cooler to their Hakosuka clad in a personalized paint job. 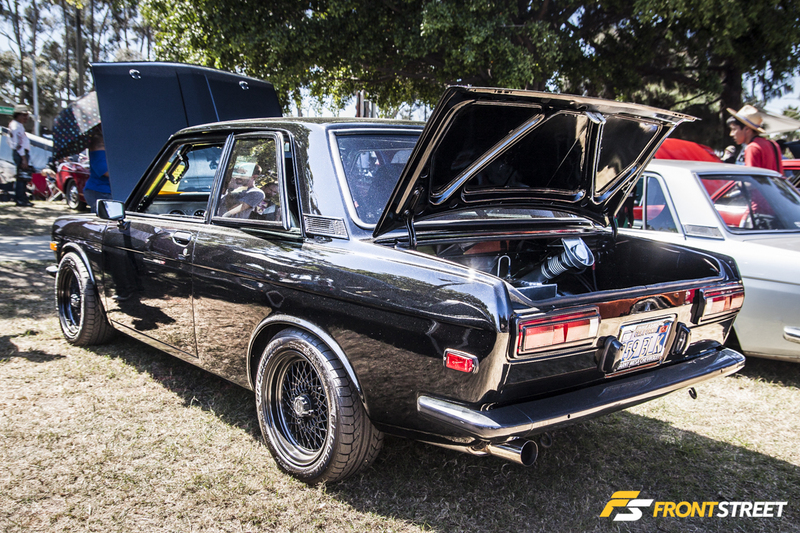 One of the most pristine examples of the popular Skyline chassis in attendance, this Hako on RS Watanabe wheels had been completely restored from the grill, to the OEM interior. 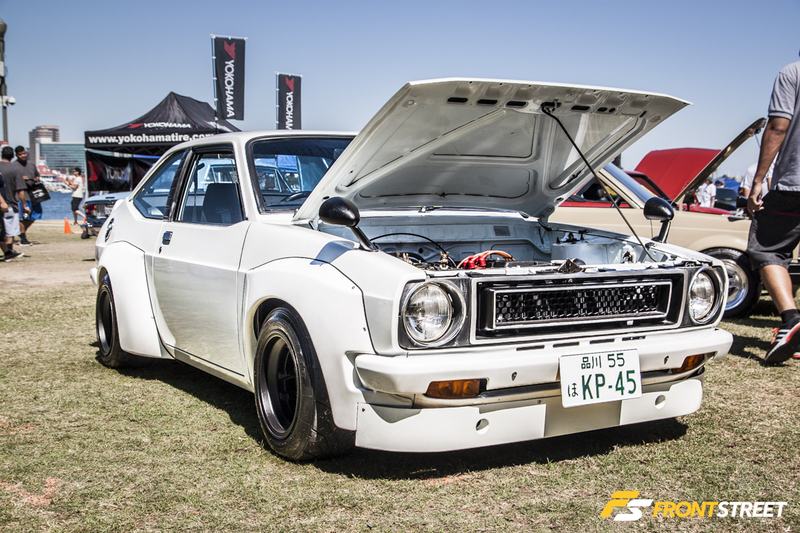 Fender flares, and new wheels widened the stance of this KP45 Toyota Starlet. 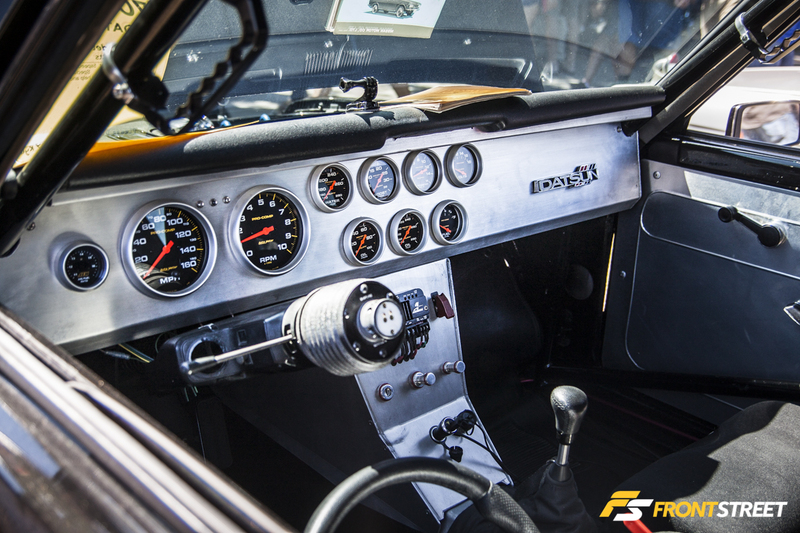 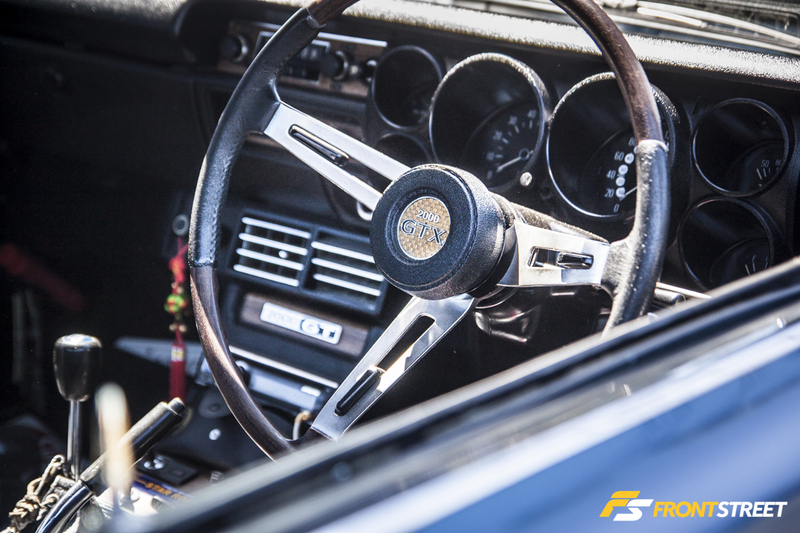 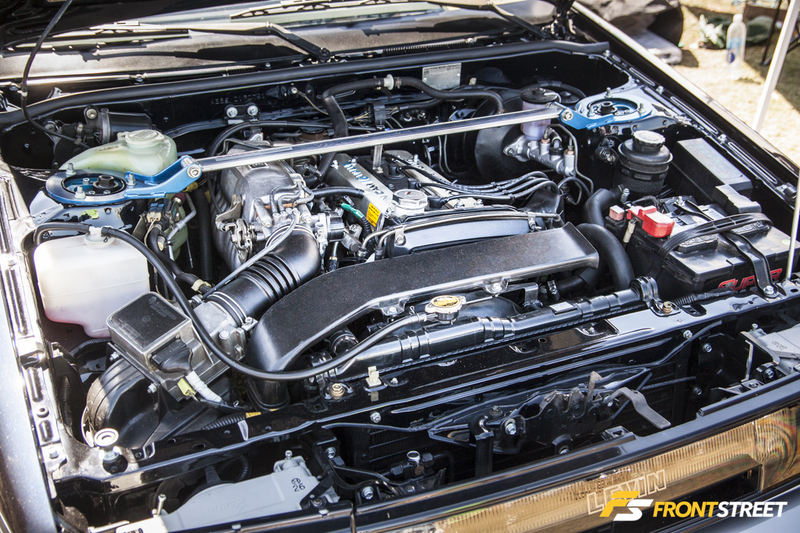 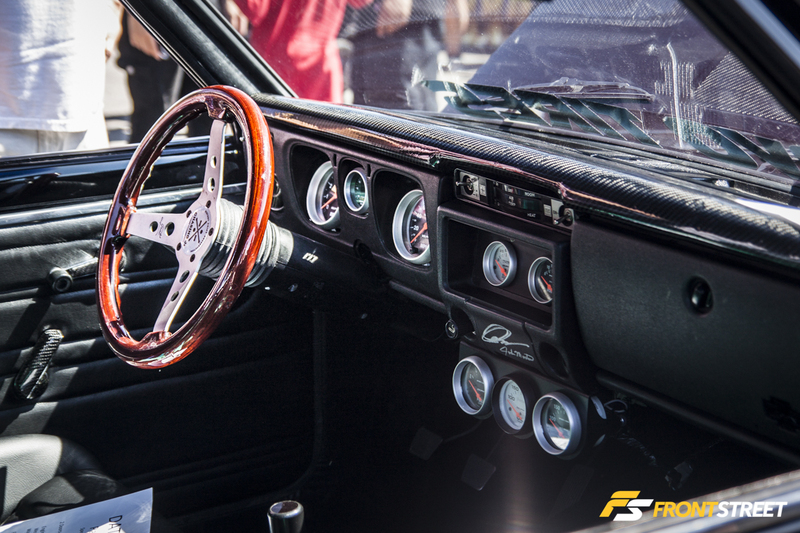 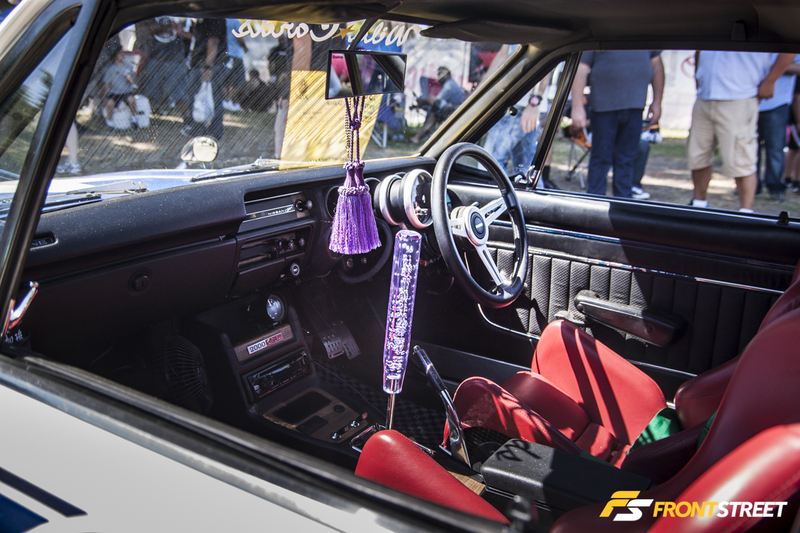 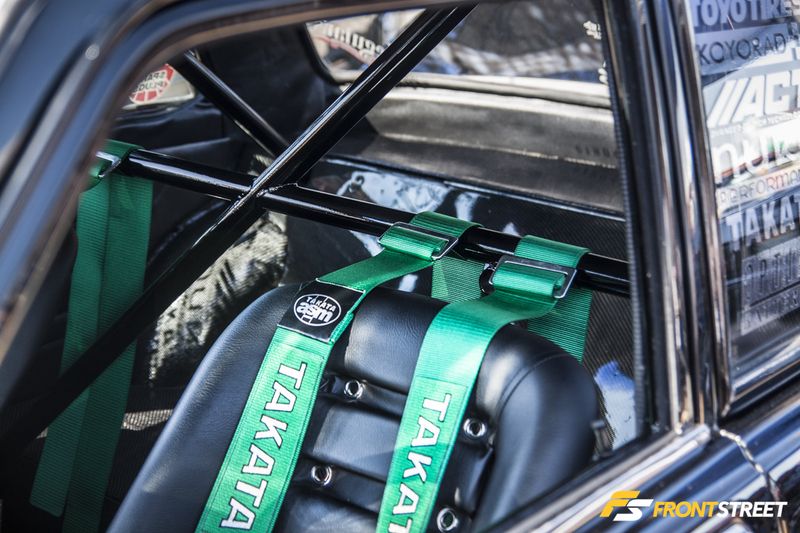 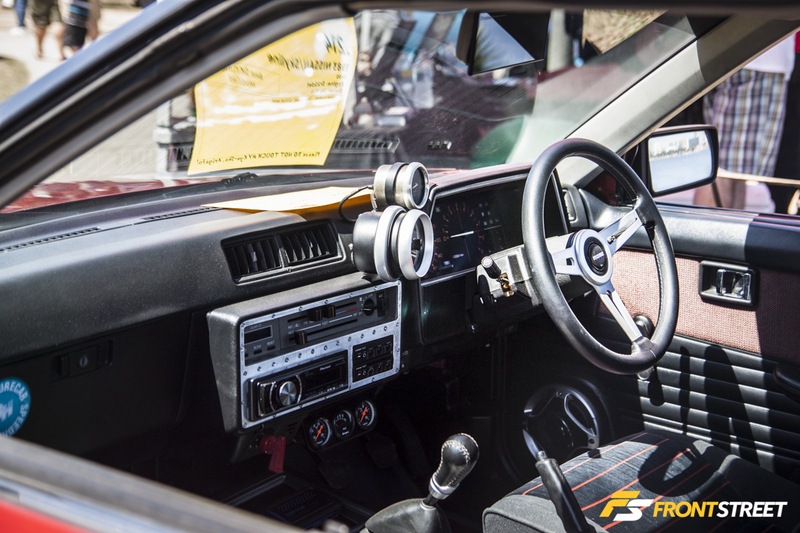 Similar to the black Datsun 510 earlier in our coverage, this SR20DET swapped sample featured an organized dash setup, full roll cage, and fuel system in the interior. 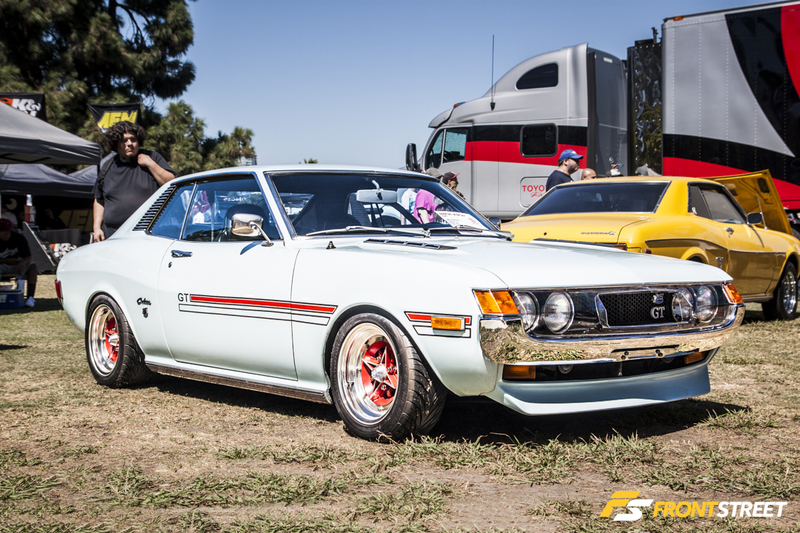 The TA22 Celica GT is an aggressive chassis style, including the grill cover for better aerodynamics. 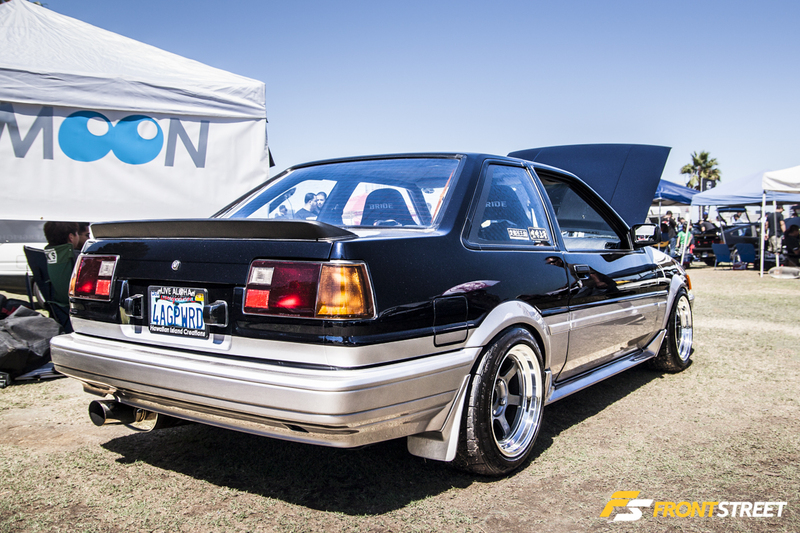 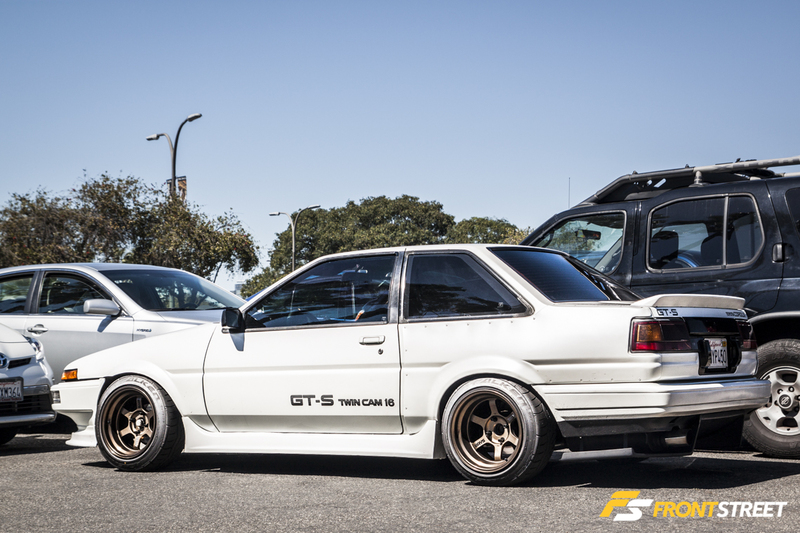 Roaming the parking lots of the show yielded the reward of an NA1 NSX on SSR Hasemi wheels and this AE86 GT-S Corolla on Volk Racing TE37V wheels.